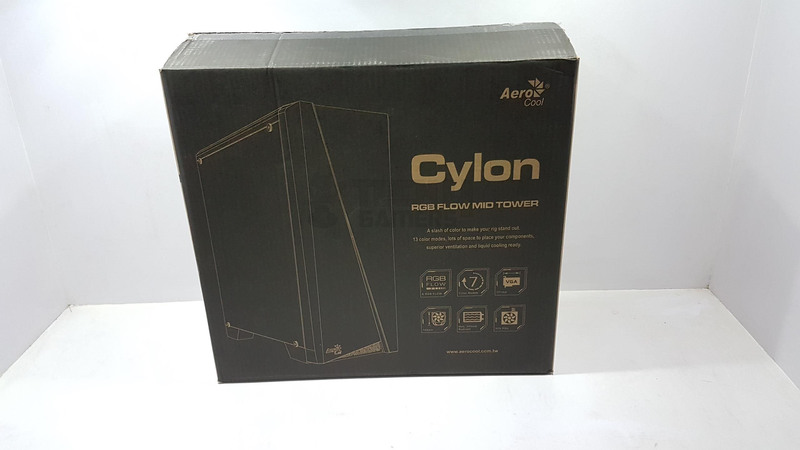 Aerocool has sent use their new Cylon RGB chassis for the review. 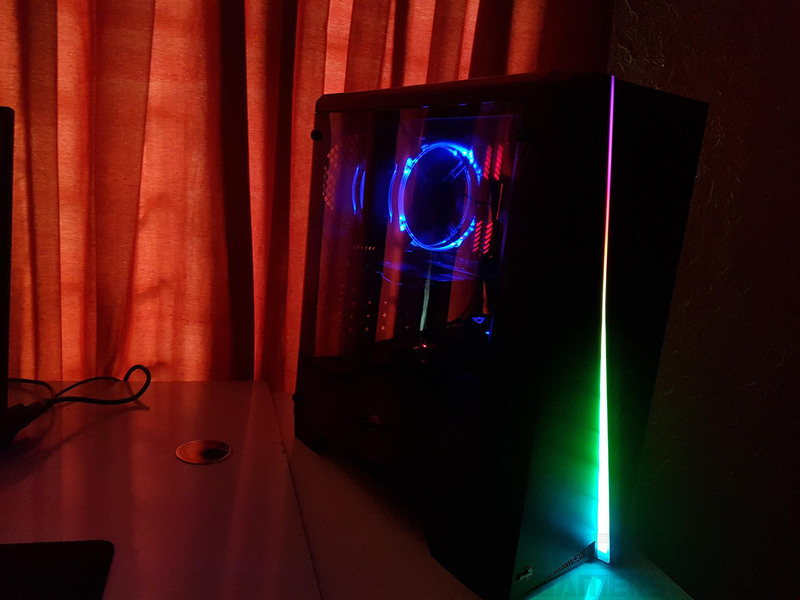 This is a compact, mid-tower chassis that has a stunning RGB implementation on the front panel that makes it stand out. 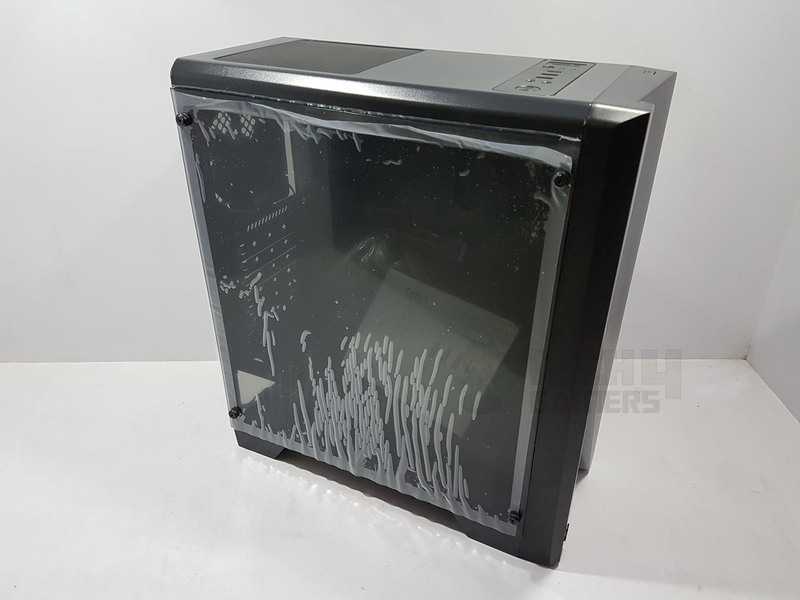 Like other budget mid towers, this chassis has few compromises as well as functionality like full length PSU Shroud, RGB Flow on the front, good enough clearance for the Graphics card and CPU Cooler, Dual Chamber design for better ventilation etc and its price makes it work the bucks that you could spend on a budget level mid-tower chassis. Its footprint reminds me of the Corsair 460X though both are from a different class altogether. 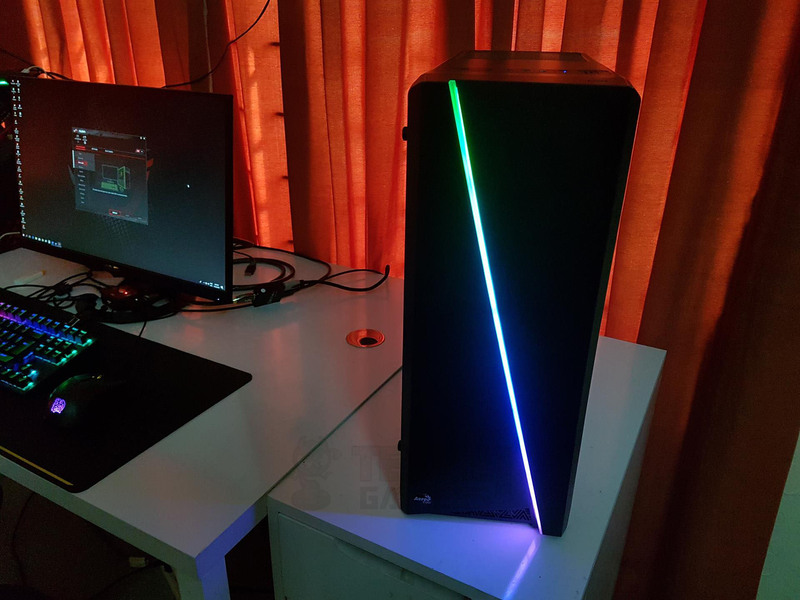 Wit a fully assembled PC, this chassis looks phenomenal on any gamer’s table. 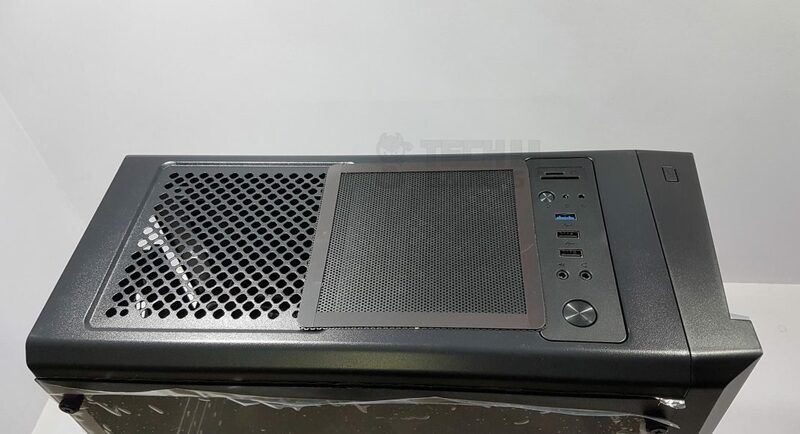 We can see where Aerocool is going with this design. They are clearly targeting gamers who are on budget yet gamers on the go as well. 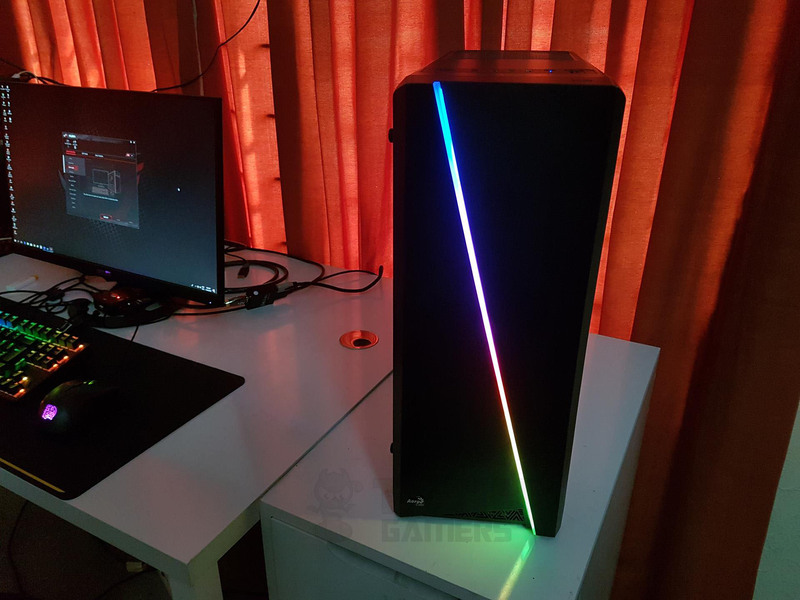 That is why they incorporated a few of design approaches that we can see on some high-end mid towers yet being lightweight to be easily carried along, though this may have come at dropping few design elements that I would rather approve to be incorporated in the next iteration. It is available in black and white color options depending on the taste of the buyer. 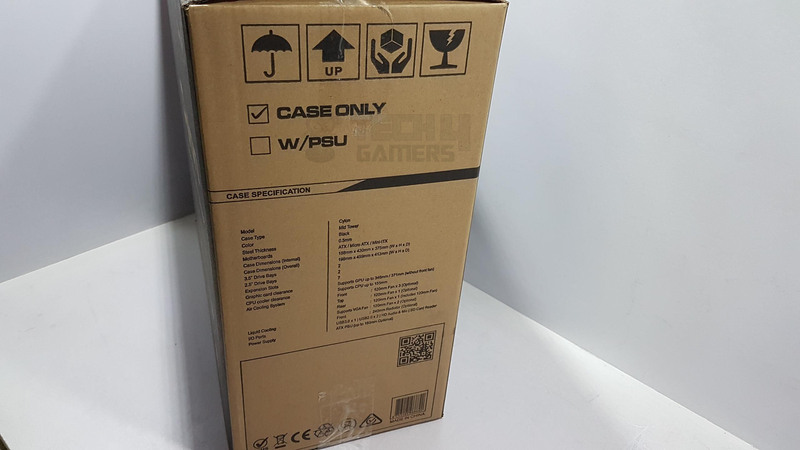 The chassis is shipped in a cardboard box in black and typical brown colors. The front and the back sides have identical layout. There is a diagram of the chassis printed on the left side. 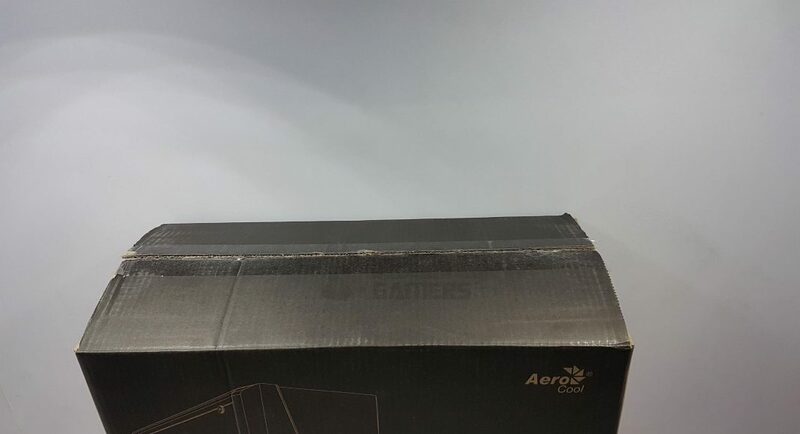 Aerocool brand name and logo are printed on the top right side. 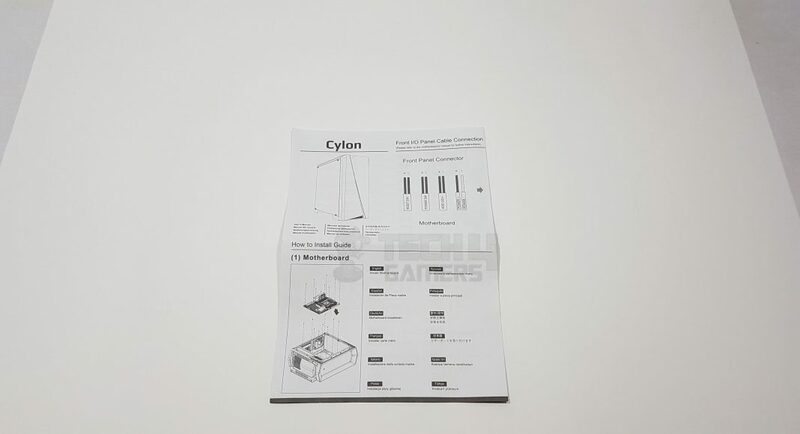 Cylon RGB Flow Mid Tower is printed on the right side of the diagram. 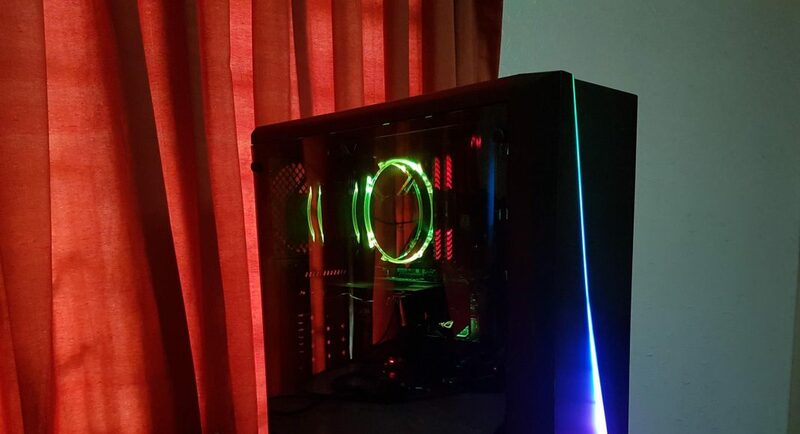 RGB features of the chassis are printed under the model name. 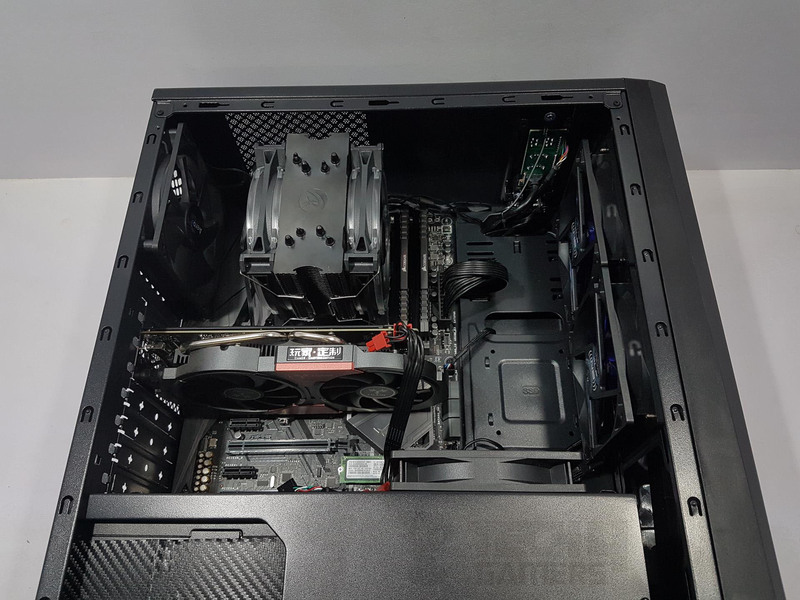 Salient features and clearance with respect to the graphics card and CPU Cooler are printed in the Iconic format. The company’s website address is printed at the bottom. The top side has no printing on it and is in plain black color to have symmetry with the front and the backsides. The right side of the box has a brown color background. 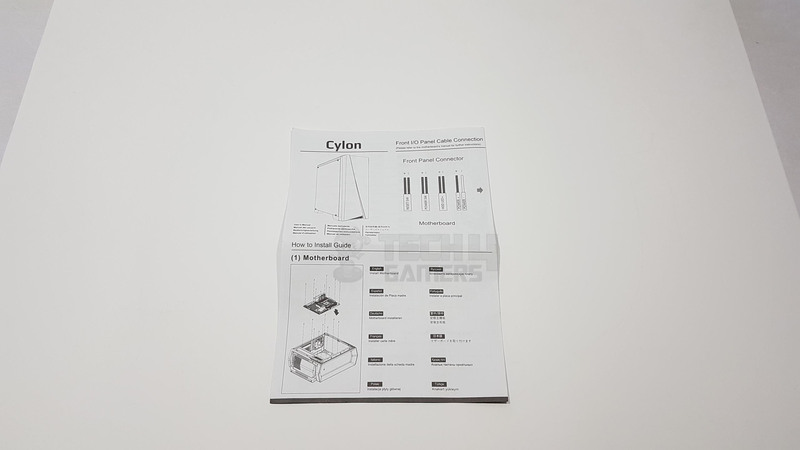 Salient features of the chassis are printed in bullet format in 12 different languages. 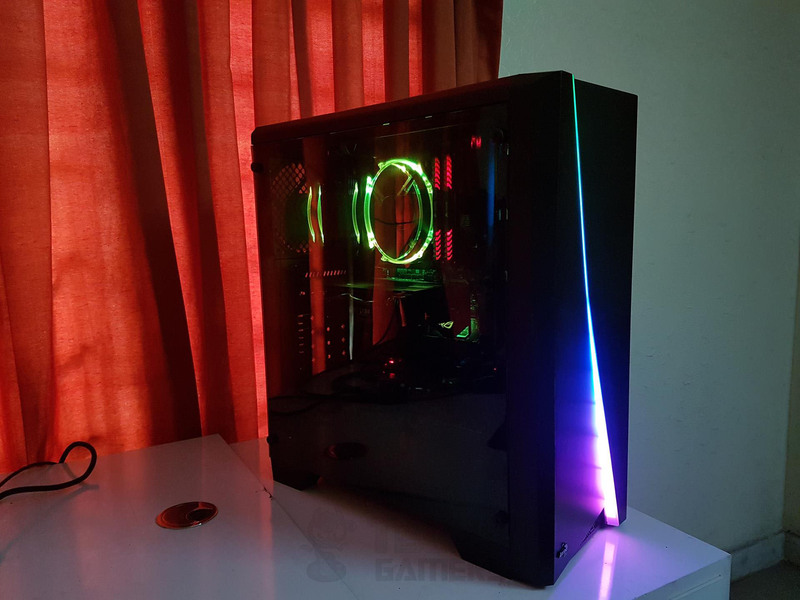 These features include 6 RGB Flow preset modes, 7 solid color modes, 240mm radiator provision on the front, 371mm (length) clearance for the graphics card and up to 155mm (height) clearance for the CPU Coolers. Dual Chamber design for better ventilation. 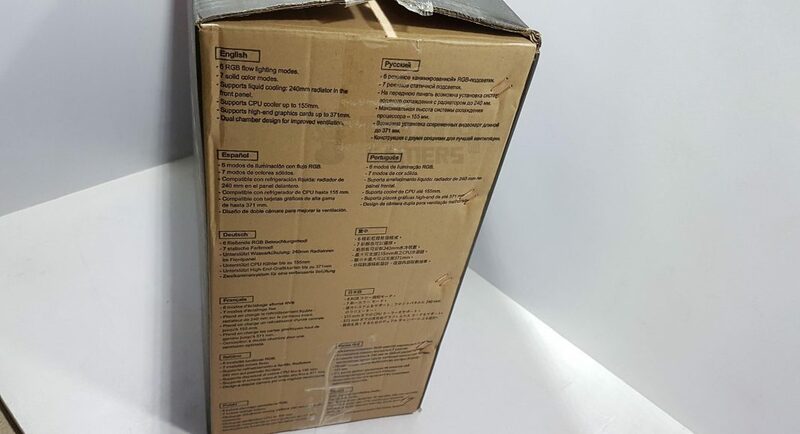 The left side of the box has a brown color background as well. 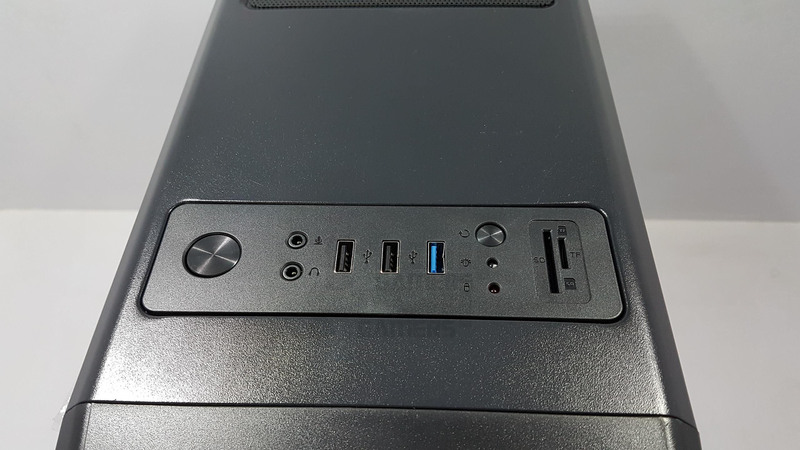 This chassis ships without PSU as indicated on the top side with two checkboxes. Case specification is printed in the tabular format in the middle of this side. The chassis is made in China. Serial no sticker is printed on the bottom right side. 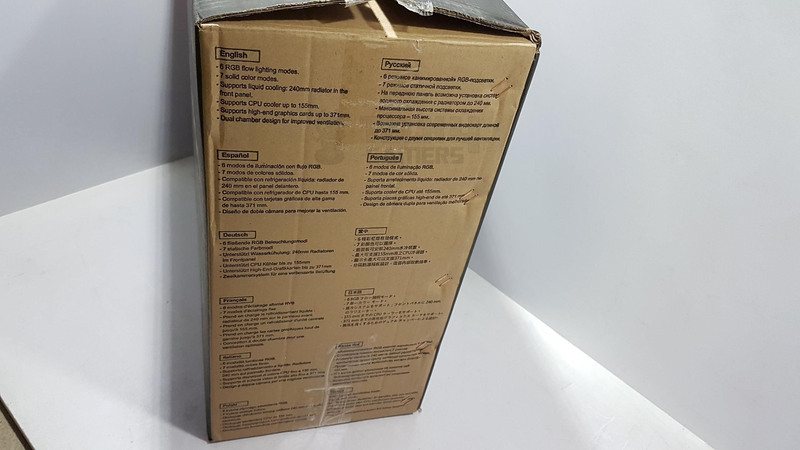 Opening the box would show the chassis wrapped inside a transparent sheet and tucker inside dense Styrofoam paddings on both sides to add much-needed safety during the shipping. The Aerocool has provided a user manual to help in installation inside this chassis and a bag full of various screws, standoffs, zip ties. 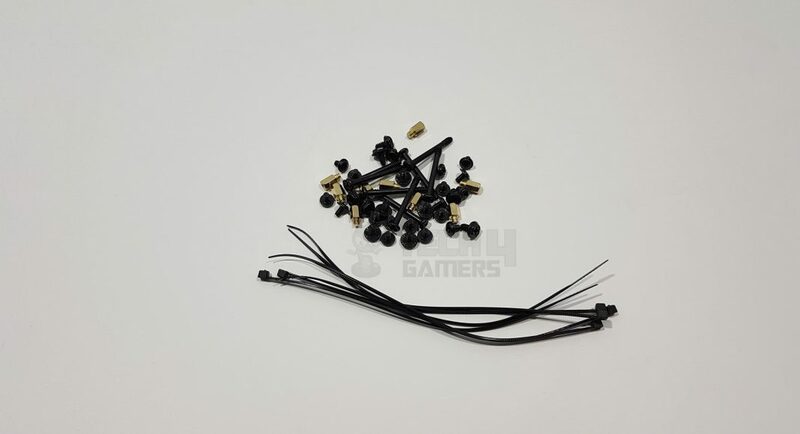 They have included long screws in case additional fans are to be mounted on the 240mm radiator if need be. 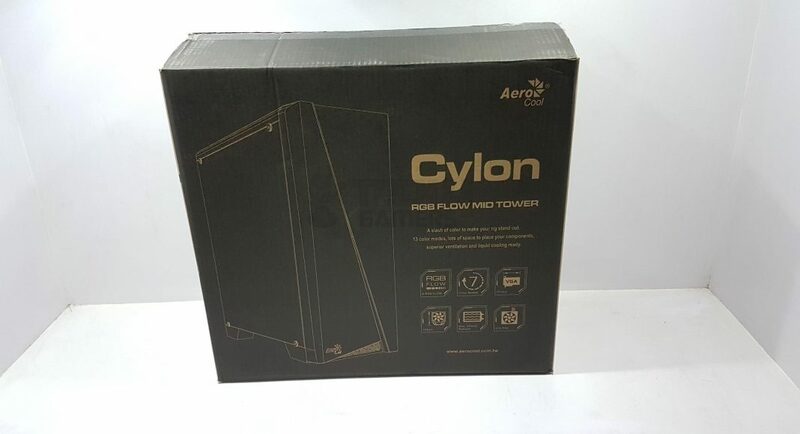 Cylon from the Aerocool is an entry-level, mid-tower gaming chassis that is compact yet spacious enough to house a well build gaming PC. 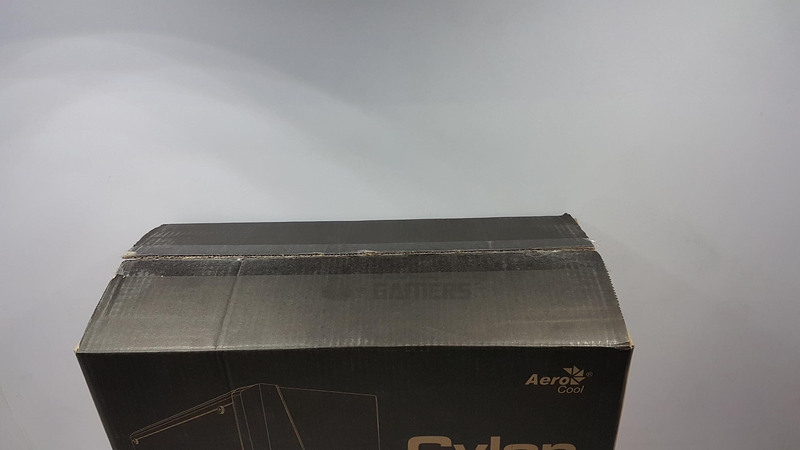 Our sample is in black color though chassis is also available in the white color at the same price which is good thinking on the part of Aerocool. 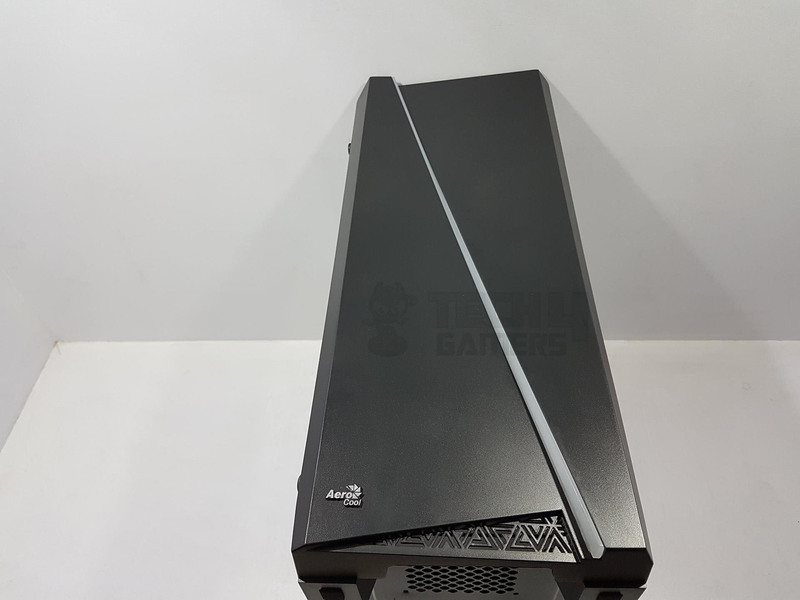 The chassis is made of steel (0.5mm thickness) and plastic and features a window side panel to showcase your build. 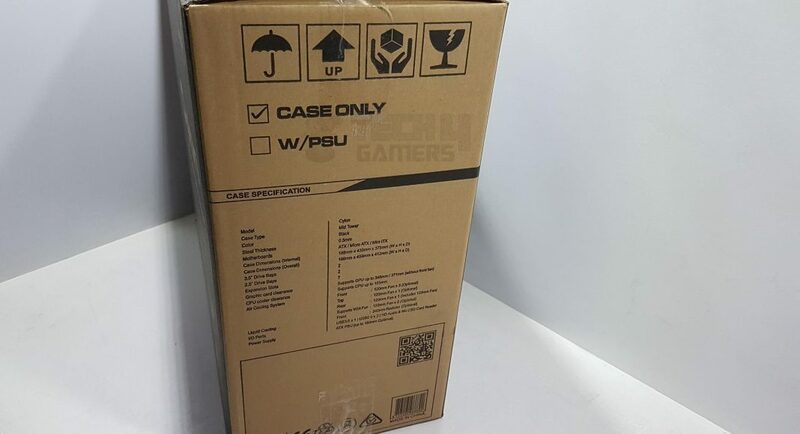 Case dimensions are 198 x 459 x 413mm (WxHxD). 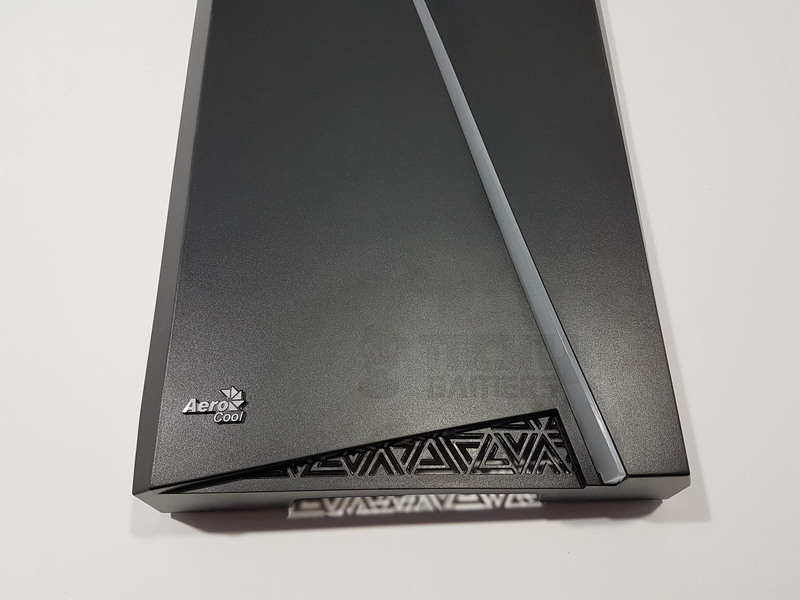 It features storage support for two 2.5” drives and two 3.5” drives which are adequate for an entry level build. 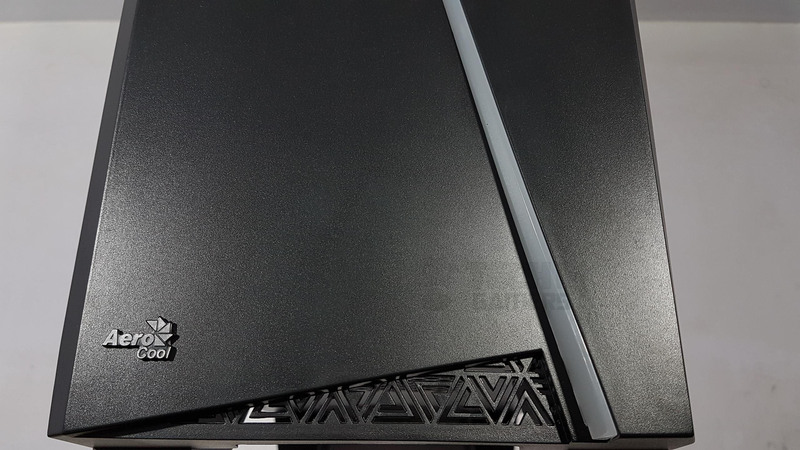 It has 7 PCIe slots and weighs only 3.8Kg without any build. 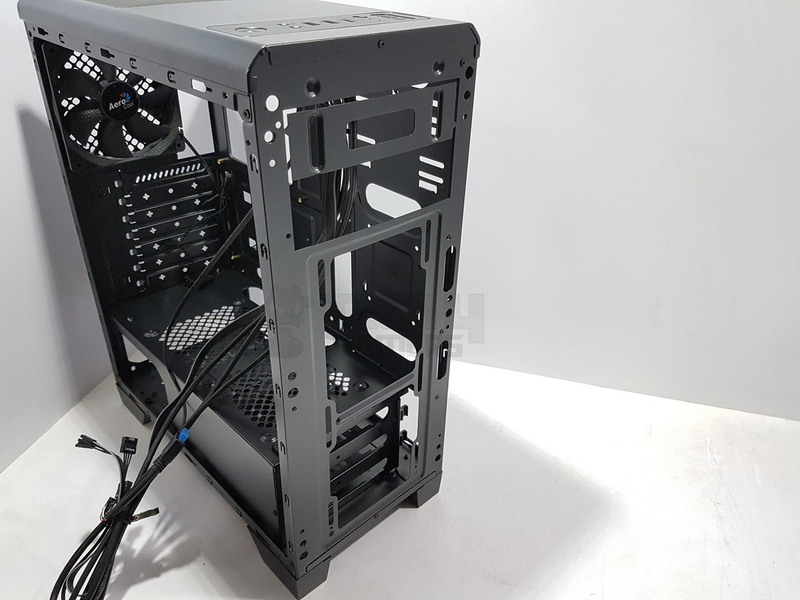 It has a support for an ATX PSU of length up to 180mm. 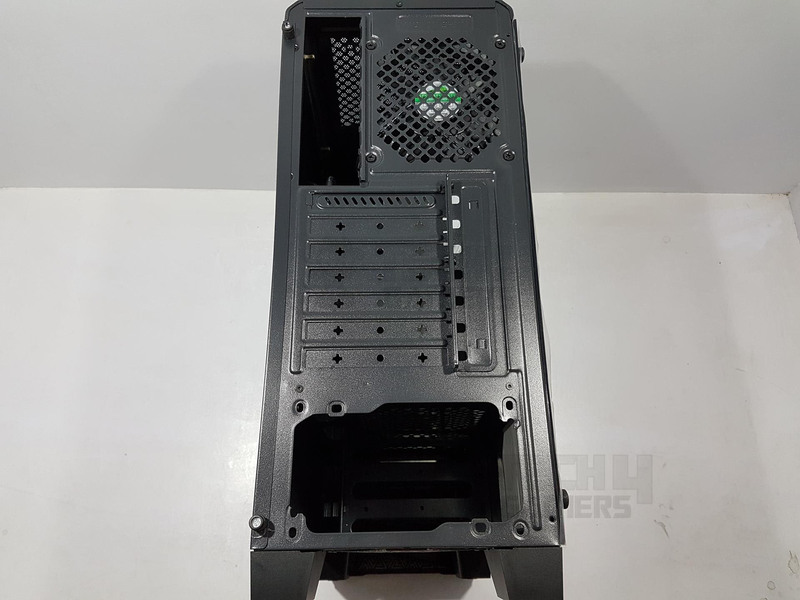 In terms of cooling support, this chassis has support for up to three 120mm fans on the front or two 140mm fans on the front, single 120mm fan on the top and at the rear with two mounting provisions on the top side of the PSU shroud for 120mm fans. 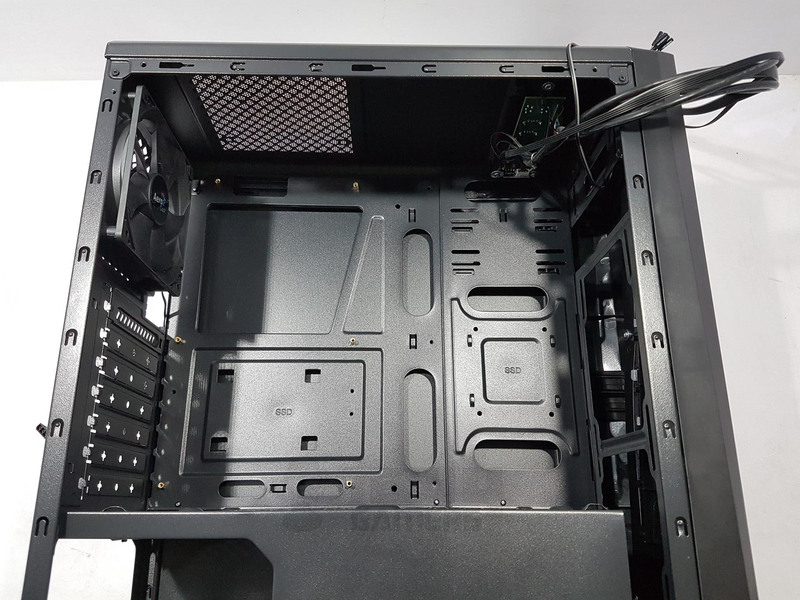 In terms of liquid cooling, this chassis has support for a 240mm radiator on the front. 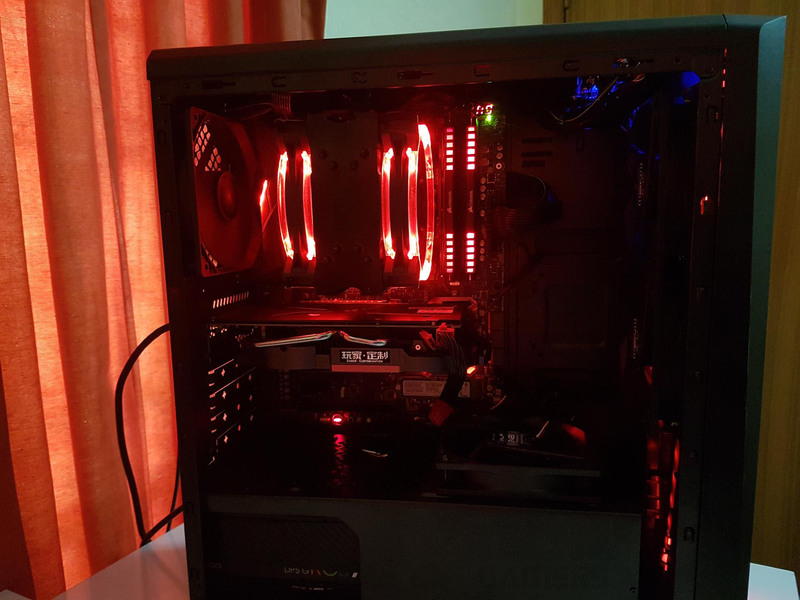 It has a support for 155mm high CPU Cooler. 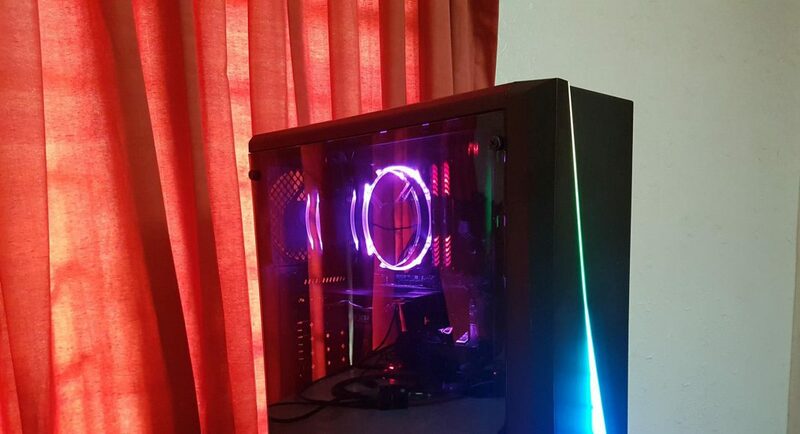 The maximum length of a graphics card can be 371mm without the front fan or 346mm with the fan. 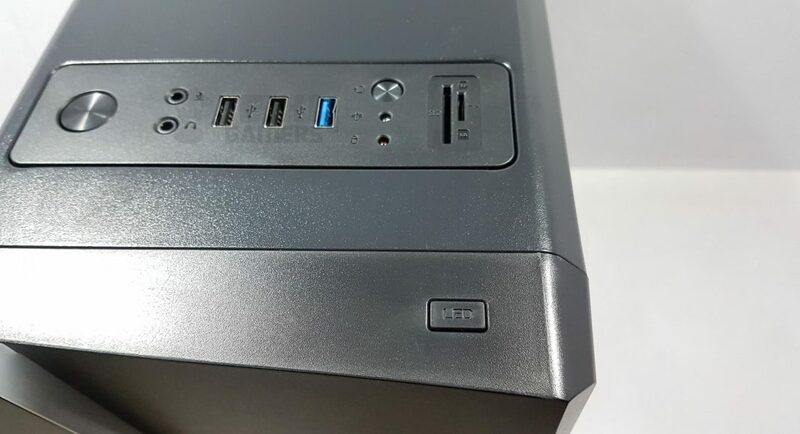 Additionally, this chassis has microSD and SD card readers on the top IO panel along with the USB 3.0 and USB 2.0 ports. 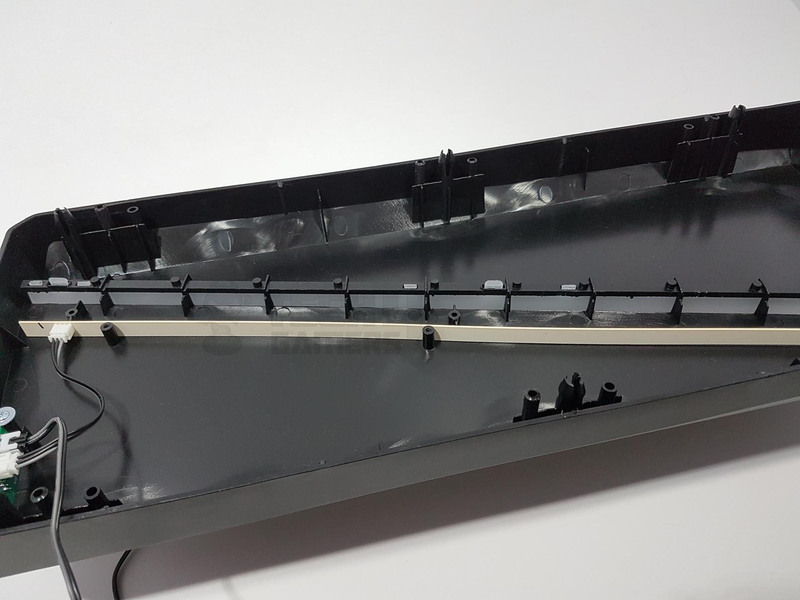 Let’s take a closer look at the chassis itself and discuss the design elements. The front panel of the chassis is a different approach altogether and is like a life of this chassis. It has a polygon design with without same alignment or we can say irregular polygon. 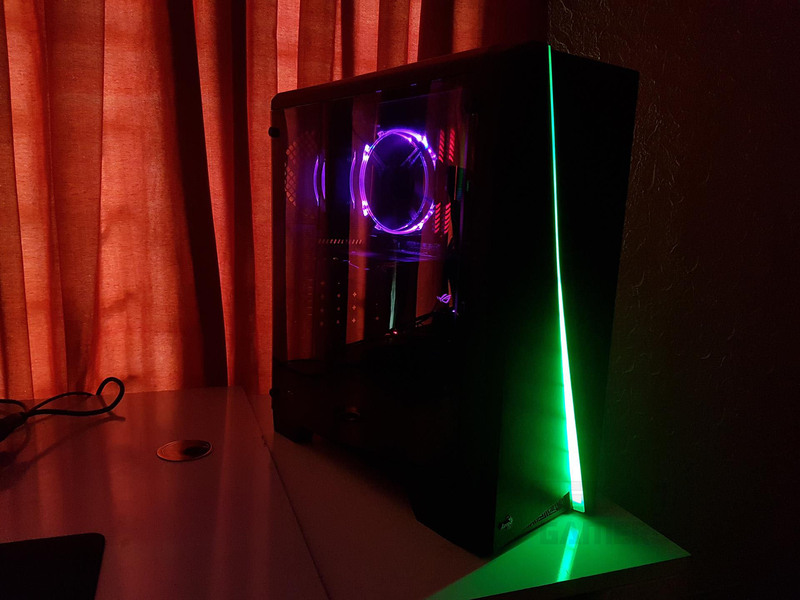 These polygons have a diffusor in frosted white color in the middle with an RGB LED strip underneath it. When powered on, this diffusor adds a stunning yet subtle look to the chassis which are quite an eye candy in real-life. This design approach has my praise. 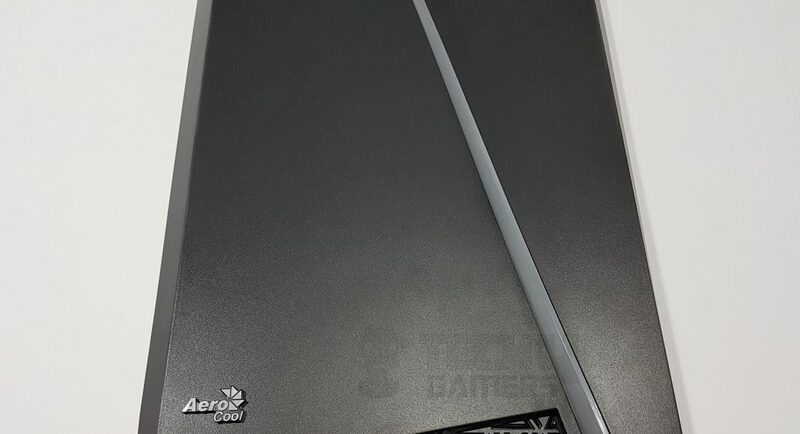 The bottom of the front panel has an elegant Aerocool brand name and logo pasted on the left side. 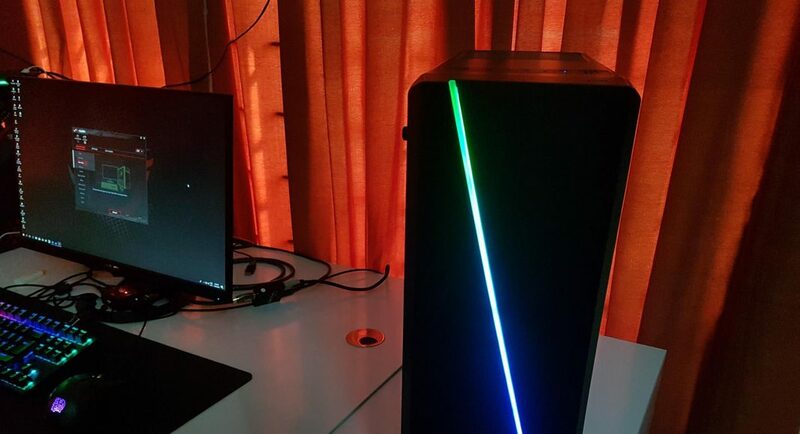 The bottom right side reminds me of the Cyan design approach that Asus is using on its ROG lineup. 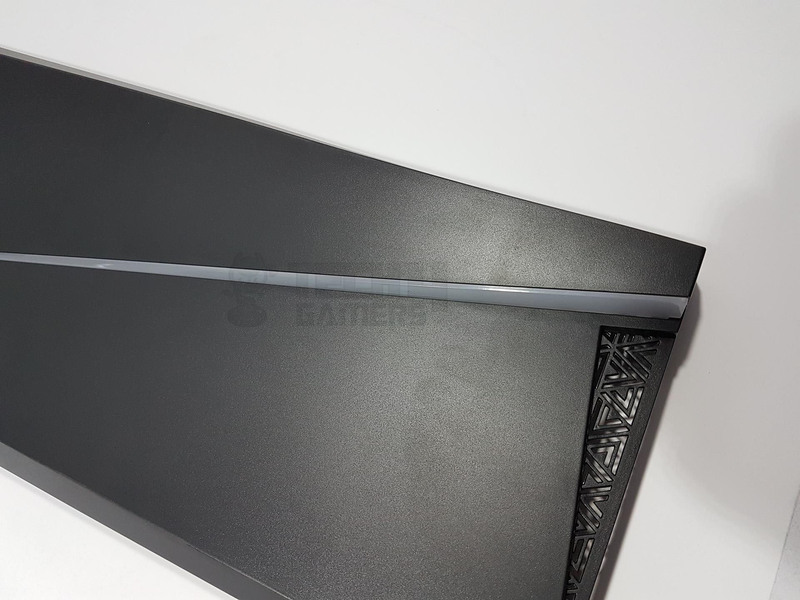 There is a triangle shaped cutout hollow design which really adds to the overall looks of the panel and is also used for fresh air intake. I wish they had made it a bit more elaborative to the extent that more of a bottom portion has it featured on it. 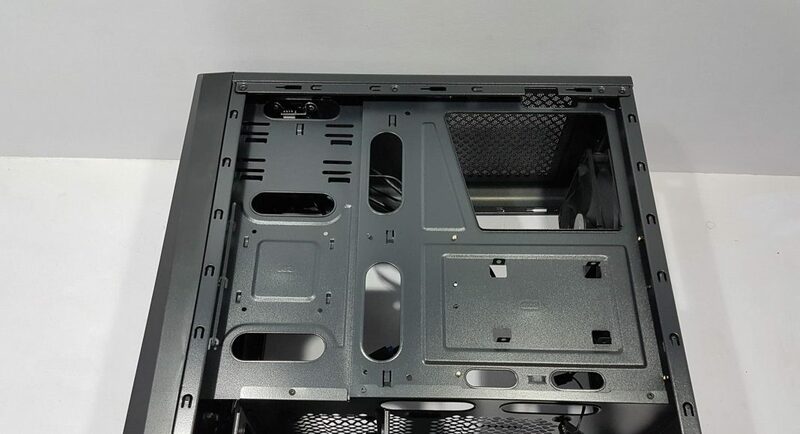 The front panel can be taken off. To do that, place your hand underneath the bottom side and pull it out. You may have to apply a bit of force but don’t overdo it or you may regret damaging the chassis. There is no vent or cutouts on the top or the left/right sides of this panel for air intake but only at the bottom. Let’s take a look at the backside of this panel. On the top, there is a power circuit to change the LED modes with a click of a button. 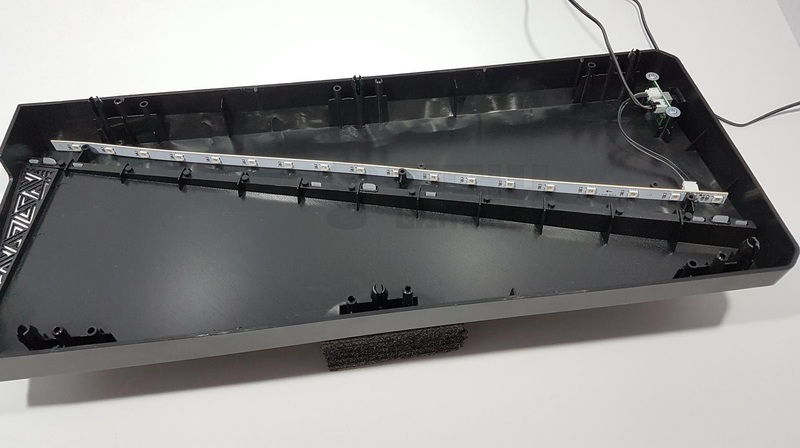 The diffusor and LED Strips are covered with a strip to avoid light leaking. 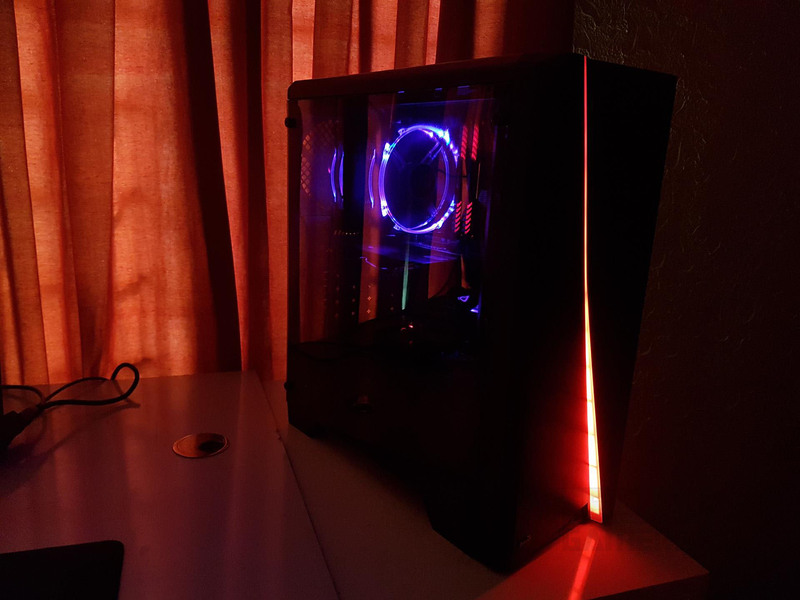 The LED strip is SATA powered which is appreciated. The cover strip can be taken off by removing three silver screws. 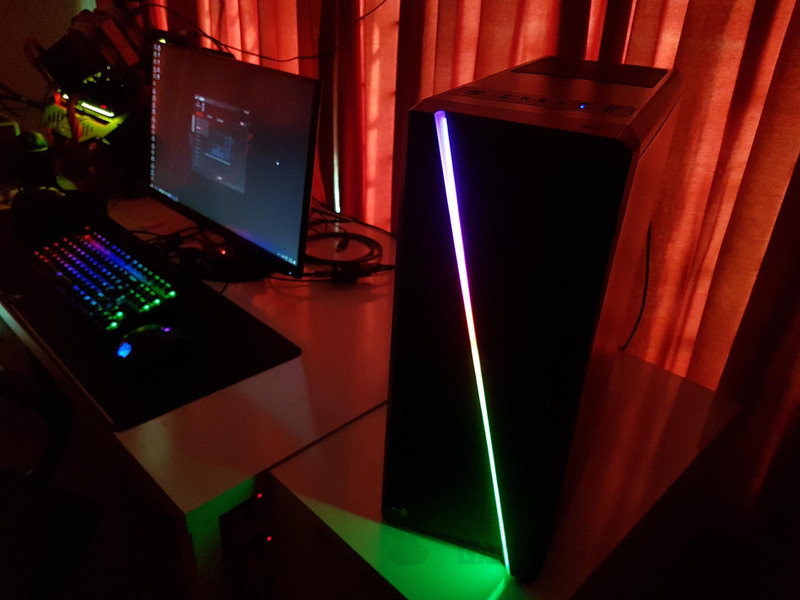 We can spot a long RGB LED strip with 18 LEDs on it. 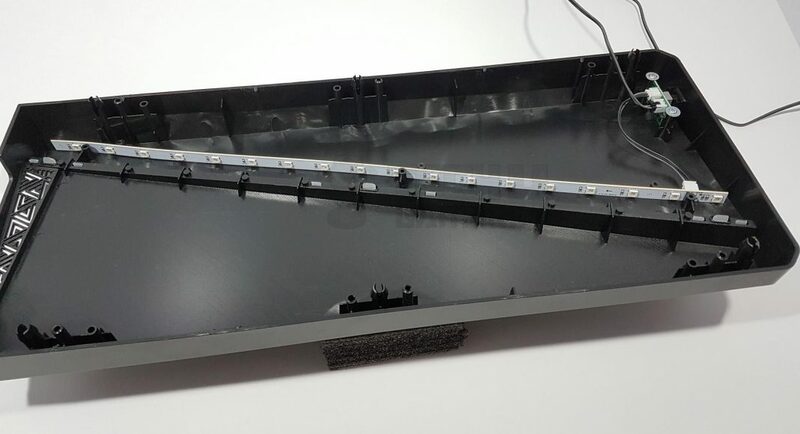 It is installed in a way that the LED strip is directly facing the diffusor. The underside of the cover strip is in the white color. This helps in light emission through the diffusor only. 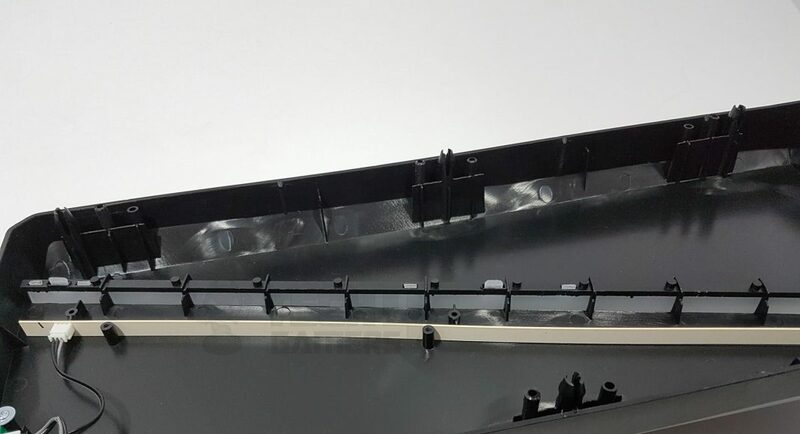 While we are at it and have removed the front panel to show its details, let’s take a look at the frame of the chassis from the front side. 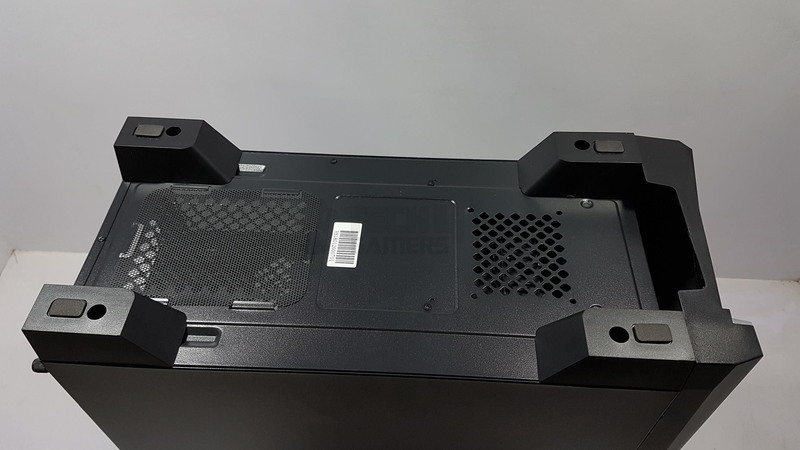 There are sliding mounting points for the 120mm fans. The top side gives the impression that chassis was designed to accommodate the 5.25” drives though there is no support from inside the chassis. There is a single cover at the top which is hinged with the frame on two points. It is loose and can be snapped off, so take care while assembling. 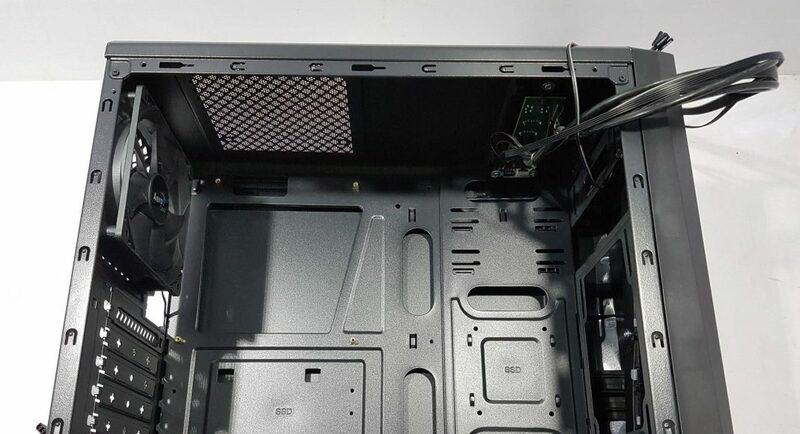 There are two cable routing cutouts on the front side which don’t make sense as the fans are installed inside the chassis, not on the outside of the front panel. Nevertheless, they are there in case you need them. The frame is solid and we have no complaint in terms of frame’s strength. 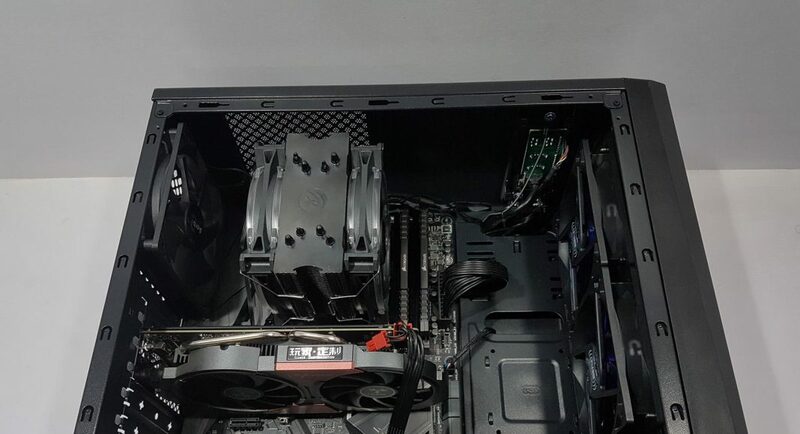 The bottom side is facing the HDD cage which is fixed under the PSU shroud and is not removable. 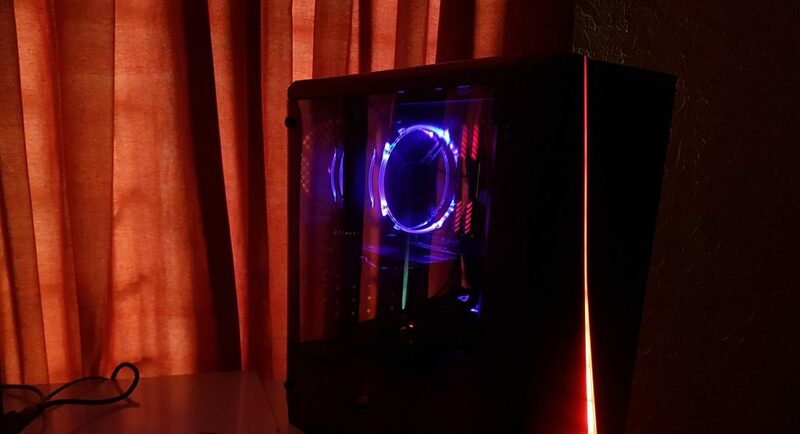 If you are to use 240mm AIO then I would suggest doing it in the middle to bottom fan mount positions. This is due to the two reasons: first, the top cover can be used but is not rigid and too much weight may snap it off. Second, there is only one air intake point from the front side which is at the bottom of the chassis. So you would want to remain near to the air intake point than being far away from it as air intake is restricted in this chassis. Let’s take a look at the top side of the chassis. 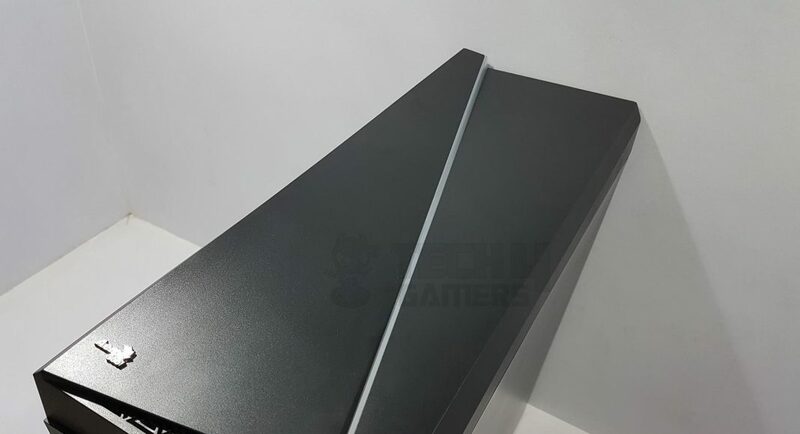 We have a beautiful two-tone black color on the top side. There is a vented area on the left side with a magnetic dust filter on it. 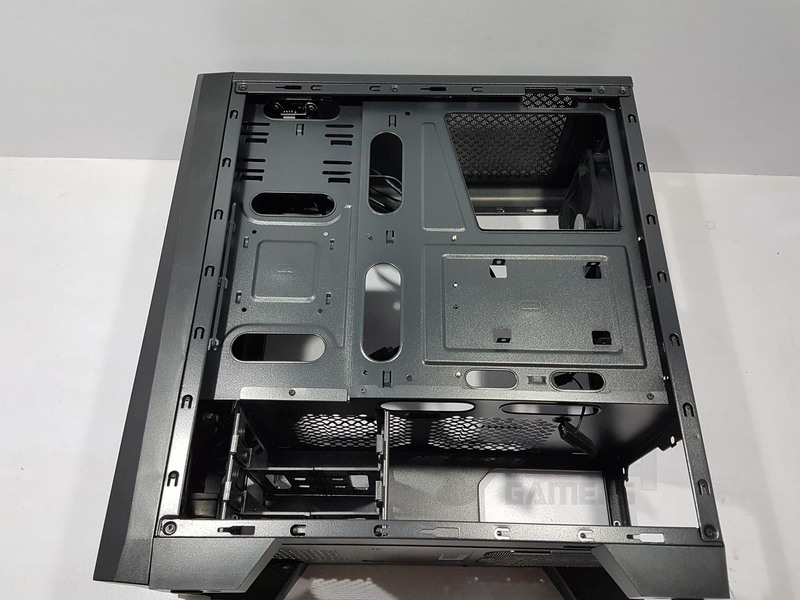 A single 120mm fan can be mounted on this spot from inside the chassis. 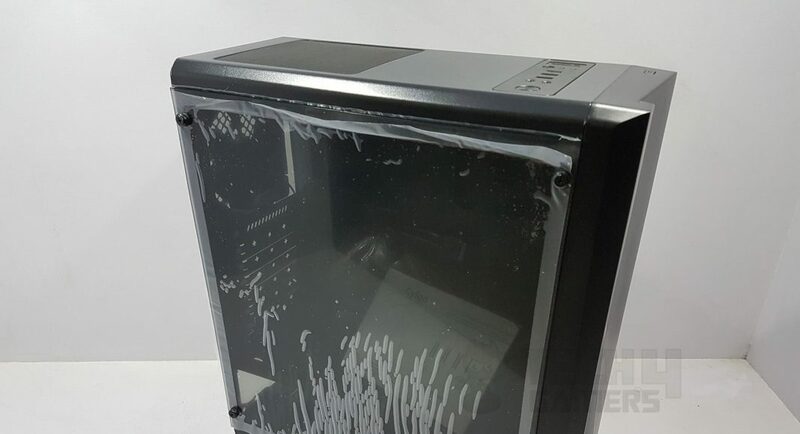 Magnetic dust filter makes it easy for the user to clean it. We have a bit different approach in terms of I/O panel on this chassis. The I/O panel is offset from the actual front side where there is only one button which is designated for the RGB Lighting control. The I/O panel has a rounded Power on/off button with a tack sound when pressed. 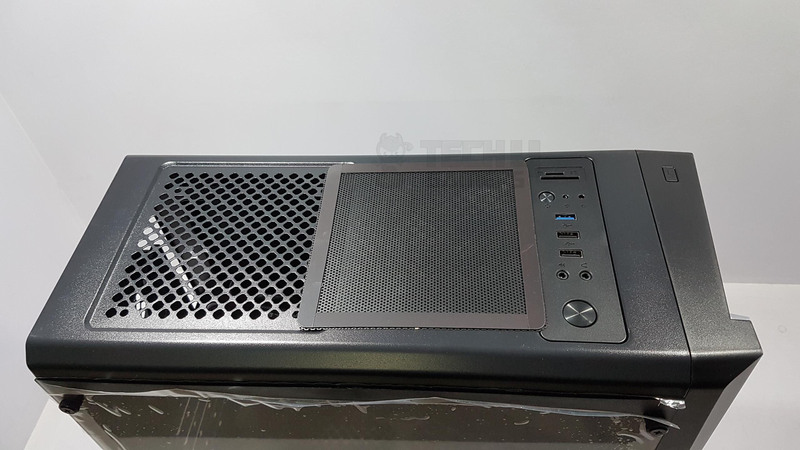 We have microphone and audio jacks, two USB 2.0 ports, a USB 3.0 port, a reset button which is bit indented inside the I/O frame. We have two LED indicators for HDD and power. On the far right side, we have a microSD and TF card reader ports which is an added functionality at this price. The rear side of the chassis has a typical layout. On the top, we have an opening for the I/O shield mounting. 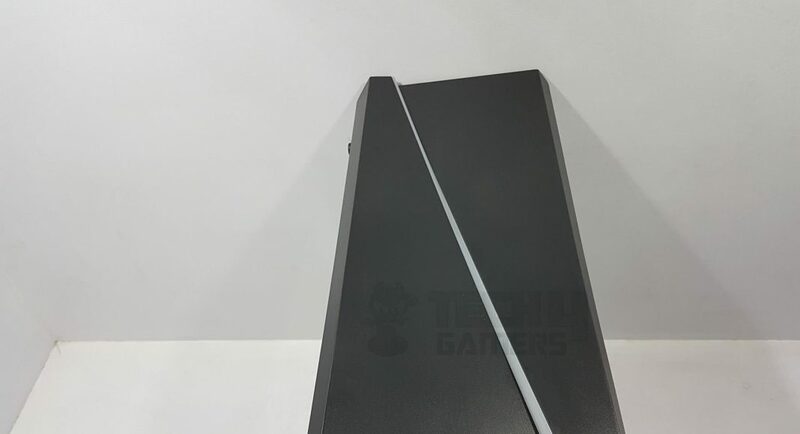 There is a 120mm fan mount location on the right side. The mounts are fixed so you can’t adjust the height of the fan. 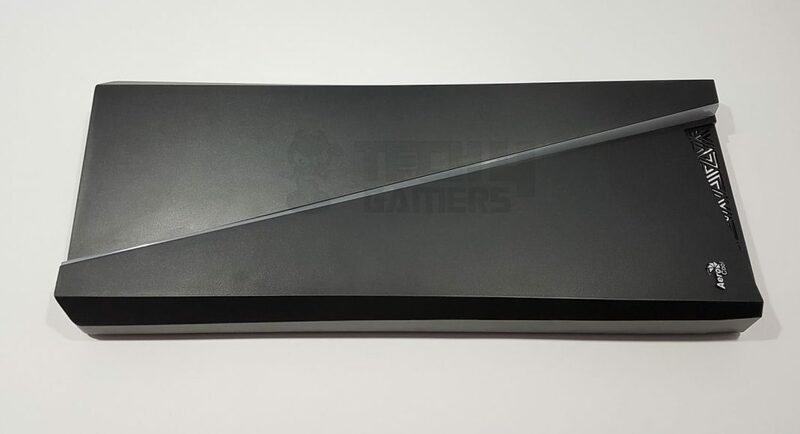 We have 7 PCIe slot covers with only the first one being a reusable, vented cover. All other 6 are fixed ones that can be snapped off and can’t be reused. This is another cost saving aspect which I would, personally, like to go away and a design where all covers can be reused is recommended. 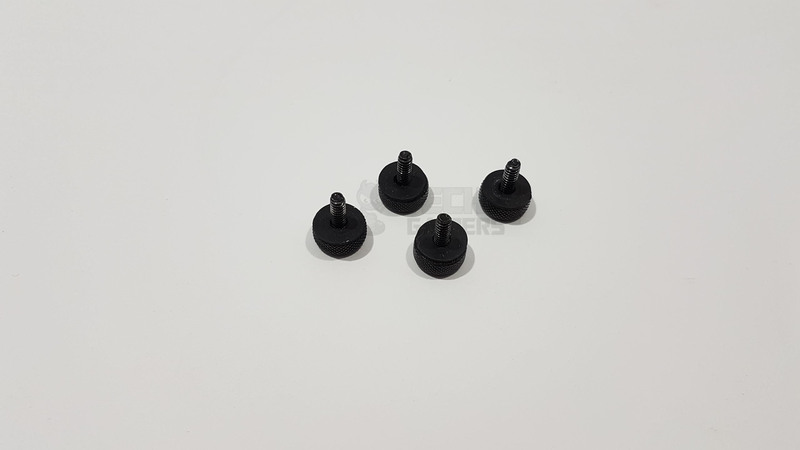 Another design element is the external screw mounting. 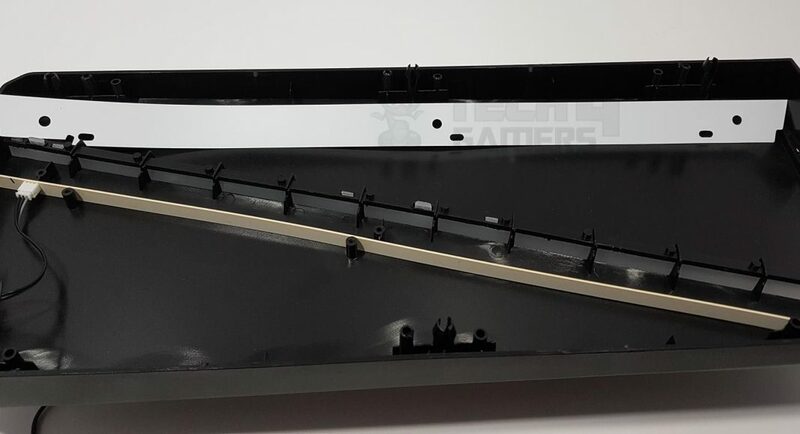 There is a cover plate with two M4 screws on it that is to be used to securely mount the graphics card on the chassis. For ventilation, the 6 covers have cutouts in the shape of + and o. There is a standard ATX PSU mount at the bottom of the chassis. 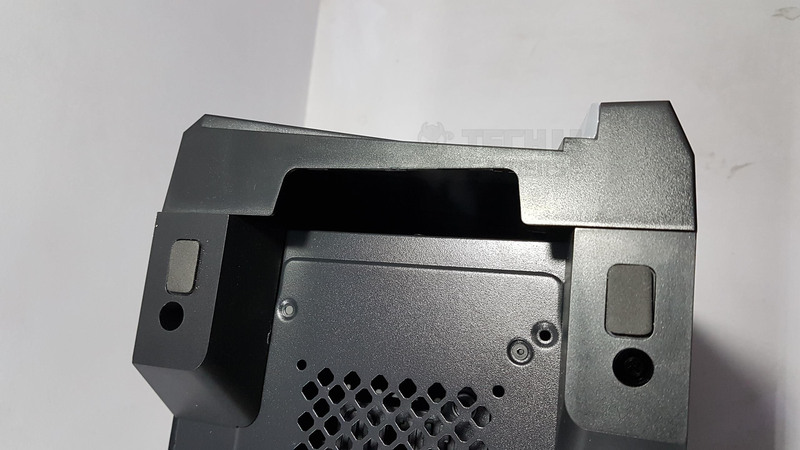 Two thumb type screws can be seen on the left side to secure the left panel on to the chassis. The window panel has a different mounting mechanism. The left side has a plain steel panel. 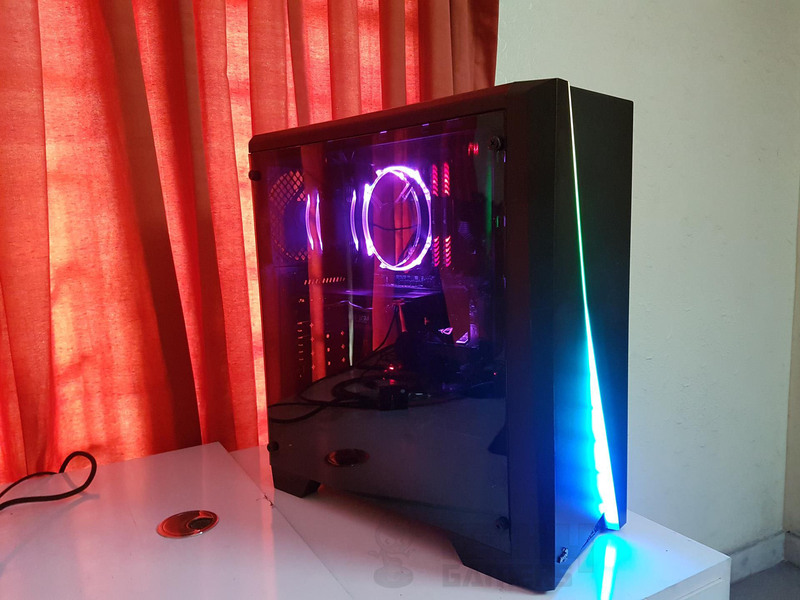 The color on the panel cover and the plastic body of the chassis can be easily distinguished though they don’t give any bad impression and symmetry is there in the design flow. 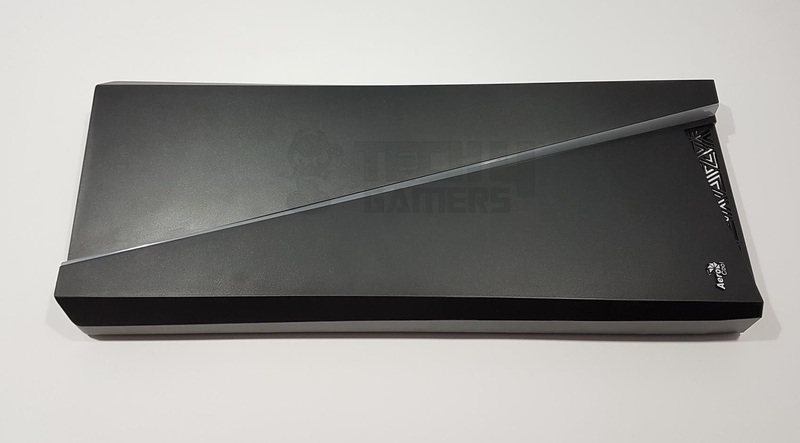 The right side has a windowed panel. 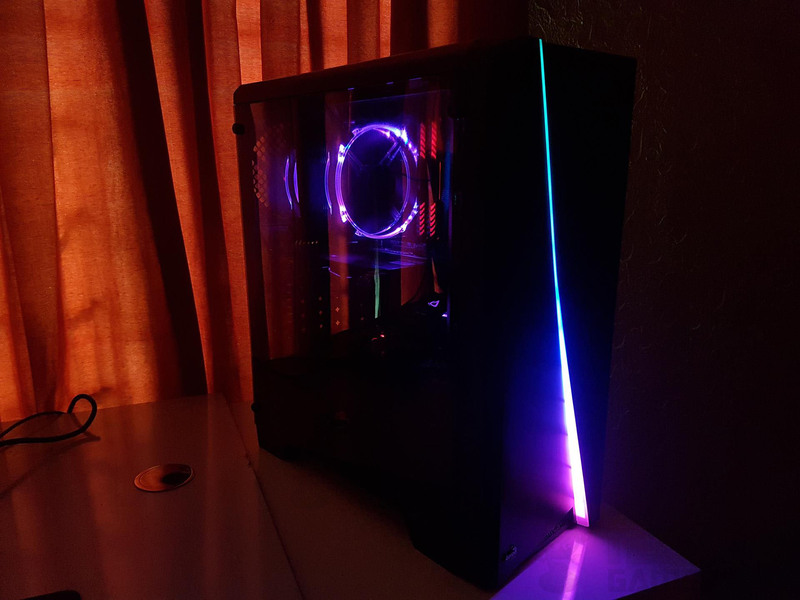 It is made of acrylic and surprisingly it follows the convention of mounting tempered glass panel. 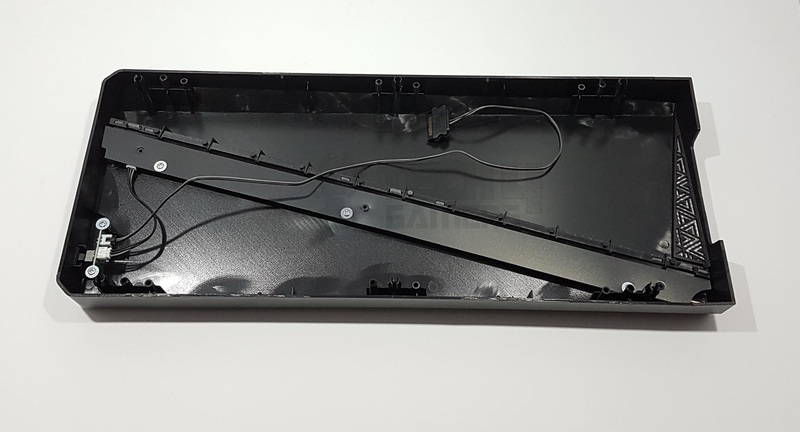 There are 4 screws with rubber washers to secure the panel on to the chassis frame instead of having this acrylic panel into a steel frame and have it mounted using two thumb screws at the rear. This is another cost saving aspect. The screw mounts are closer to the edges and one would need to be careful while installing the panel. The panel is running edge to edge and it is black tinted. 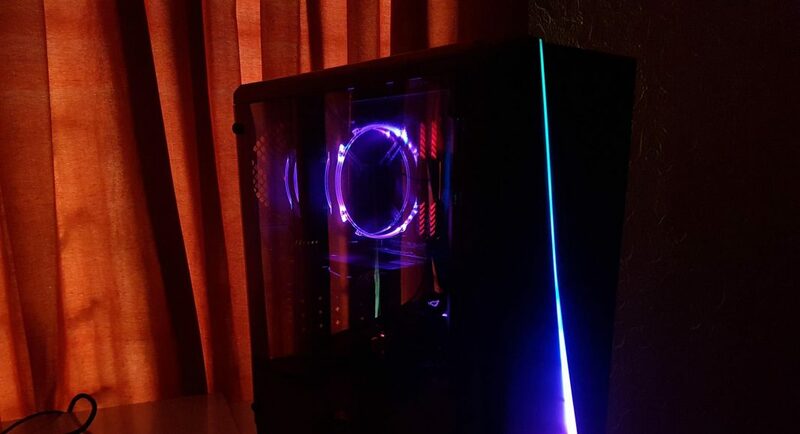 It has a high reflection due to that plus it hides the build instead of showing it off. 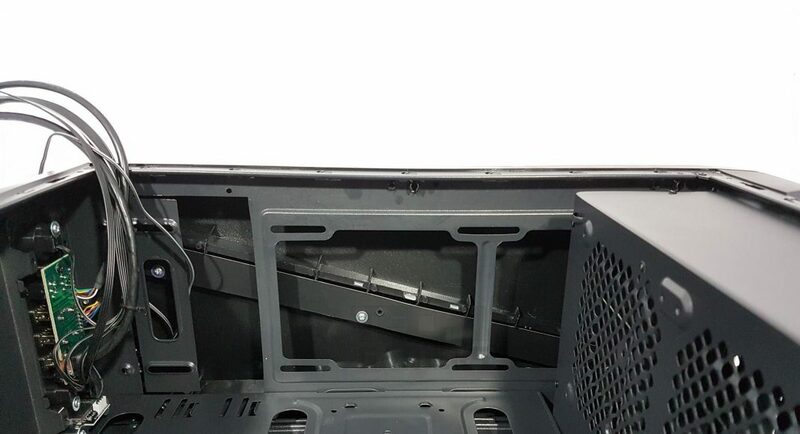 An LED lighting solution would be needed inside the chassis to illuminate the interior well enough so that it can be seen from the outside. The acrylic itself is lightweight and it has protective sheets on both sides. I would highly suggest not taking these sheets off before completing and testing the build. The panel can be easily scratched. The bottom side of the chassis has 4 long feet to raise the height of the chassis from the ground. This is essential as the air intake is from this side on the front panel. 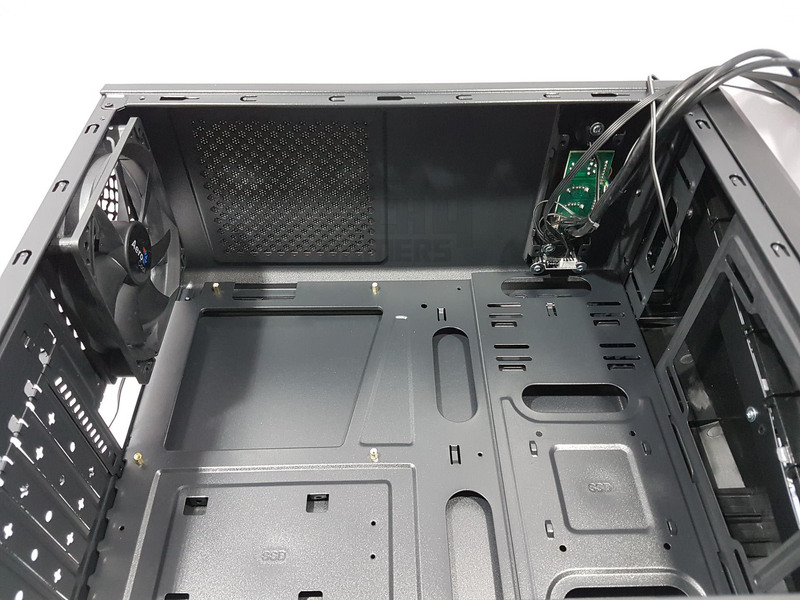 The PSU mount has a dust filter which is not magnetic. 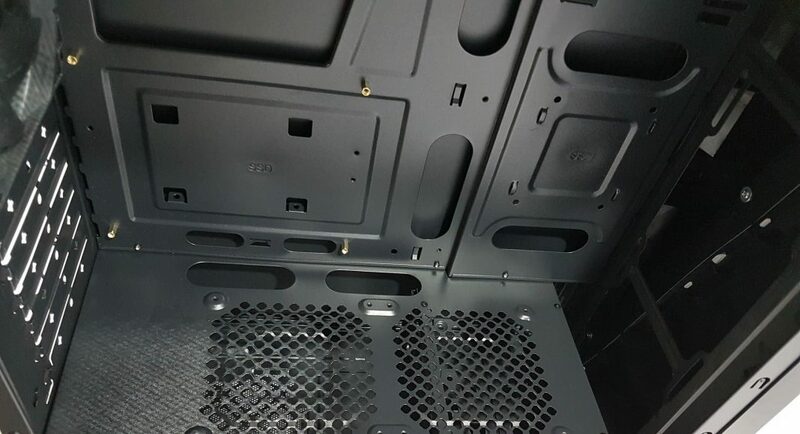 The storage drive cage has vented area closer towards the front side and it is not filtered. Serial no sticker is pasted in the middle of this side. 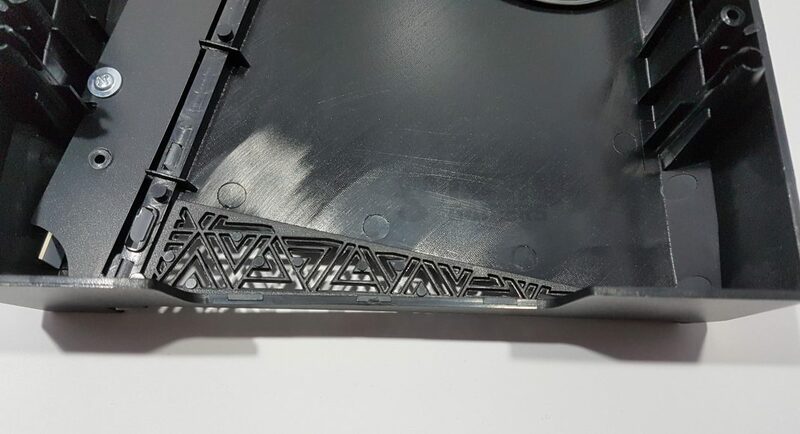 There are rubber pads on each of the foot to avoid scratching the surface where the chassis will be placed on. 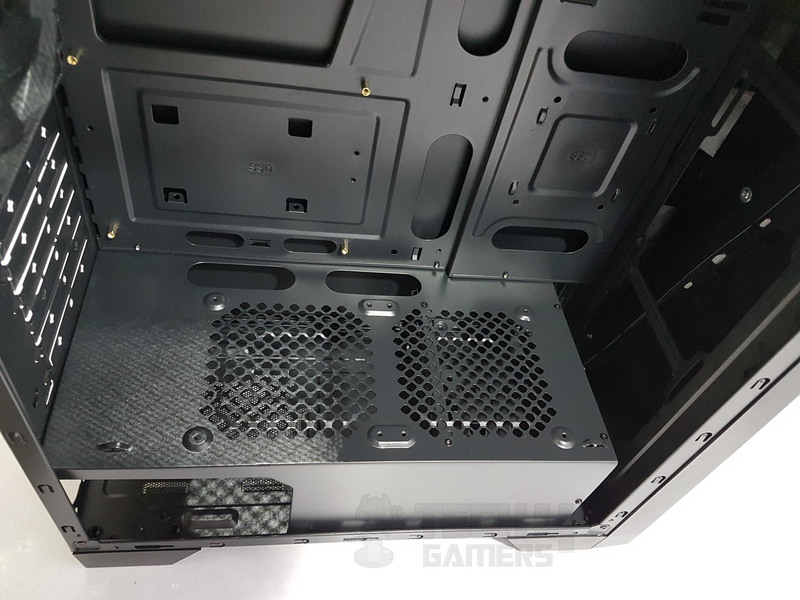 After having discussed the exterior of the chassis, it is time to look at the interior and see what this chassis offers to the budget builder. 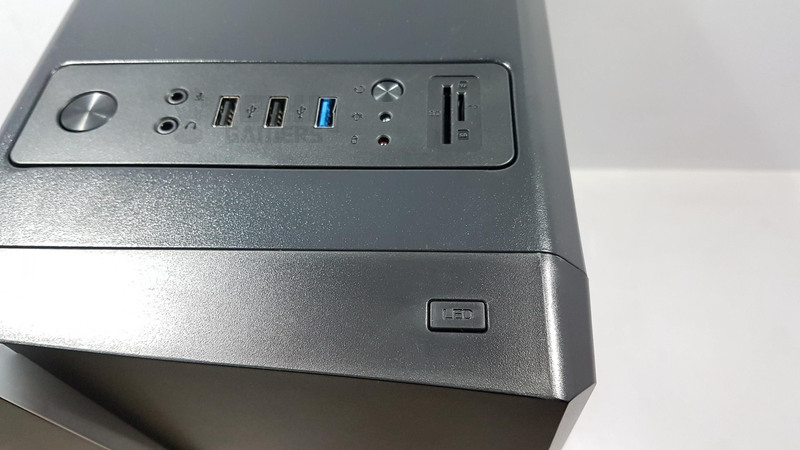 This chassis has support for ATX, microATX, and Mini-ITX form factor motherboards. 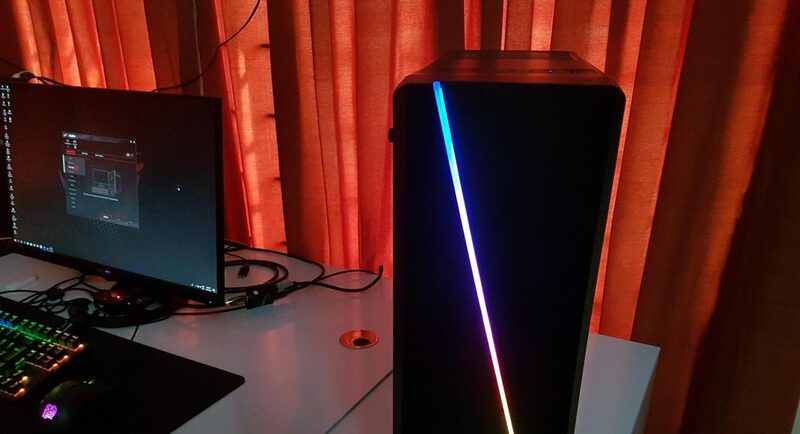 It is a compact mid-tower chassis. 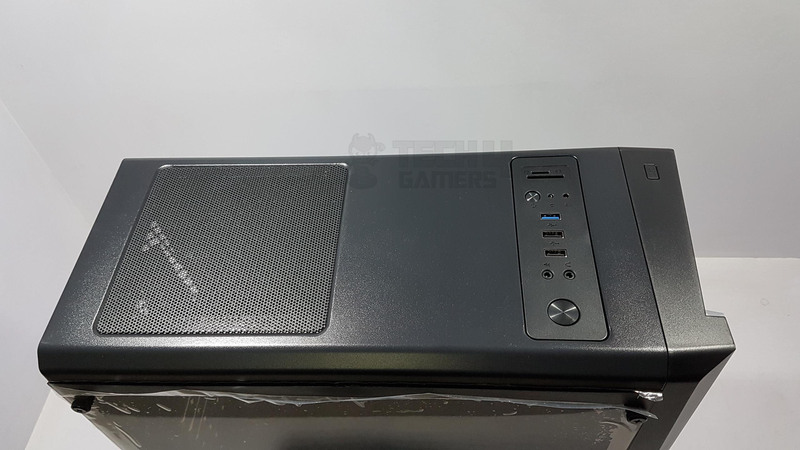 It comes with a pre-installed 120mm fan on the rear. The motherboard tray measures to the size of 12” x 9.6” to be exact including the cutouts on the bottom and the right side for the cable pass through. 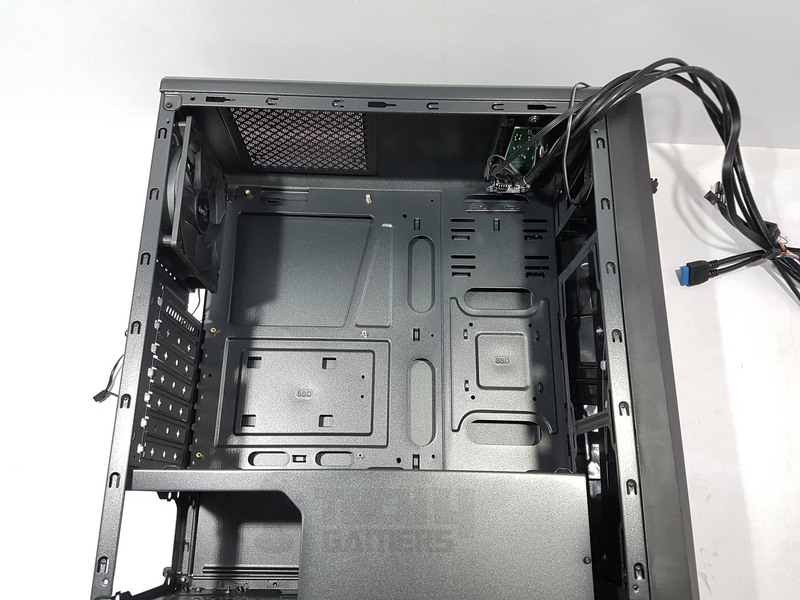 There is one cutout on the top for EPS cable passing and two cuts out are on the PSU shroud near the motherboard tray for passing and connecting the cables to the bottom headers of the motherboard. Only 6 standoffs are pre-installed. I would have loved to see all 9 standoffs to be pre-installed. 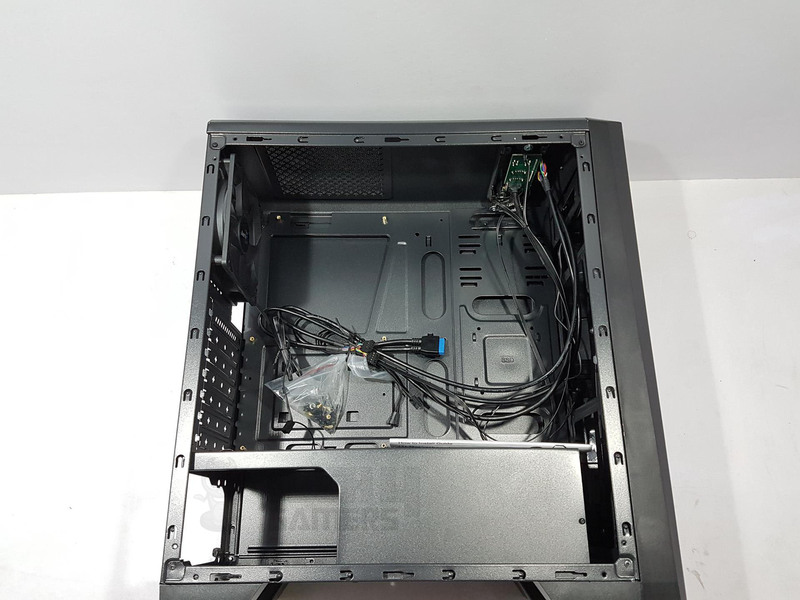 Full ATX size motherboard has a dimension of 12” x 9.6” and as such this chassis provides a challenge to the builder for the cable management on the front. 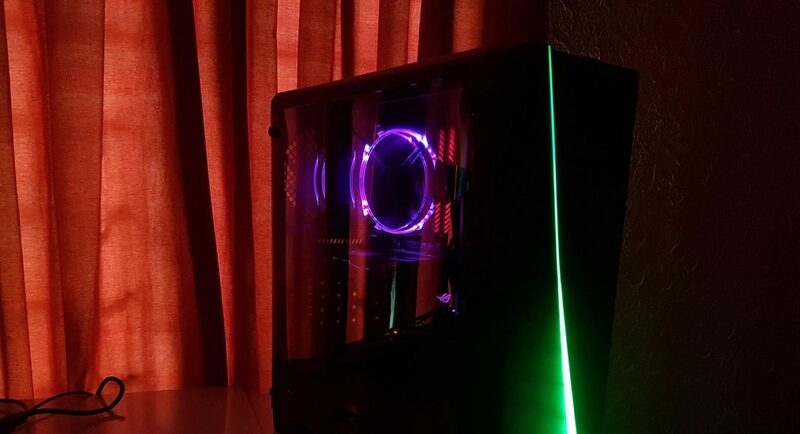 There are few motherboards with depth/length of 8.8” which are ideal for this chassis. 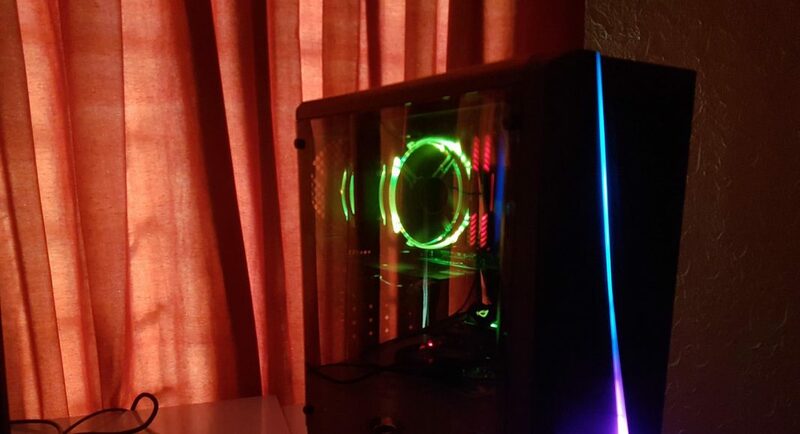 There is a mount for a 120mm fan up on the top. There is a large size CPU cut out in the motherboard tray to ease of CPU cooler installation. 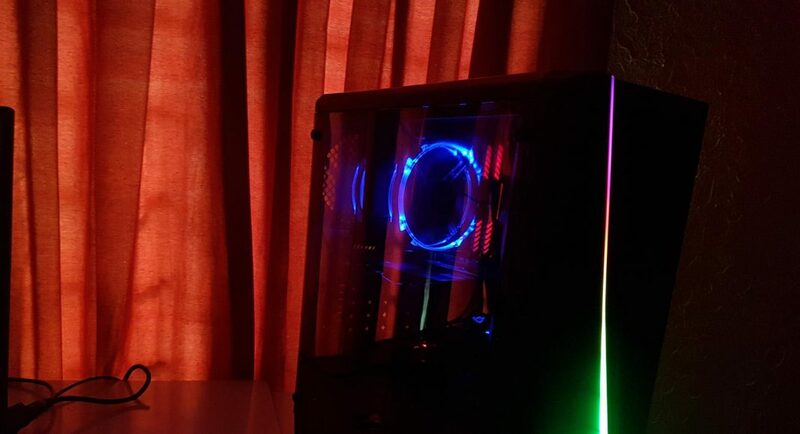 The maximum supported height for the CPU Cooler is 155mm. 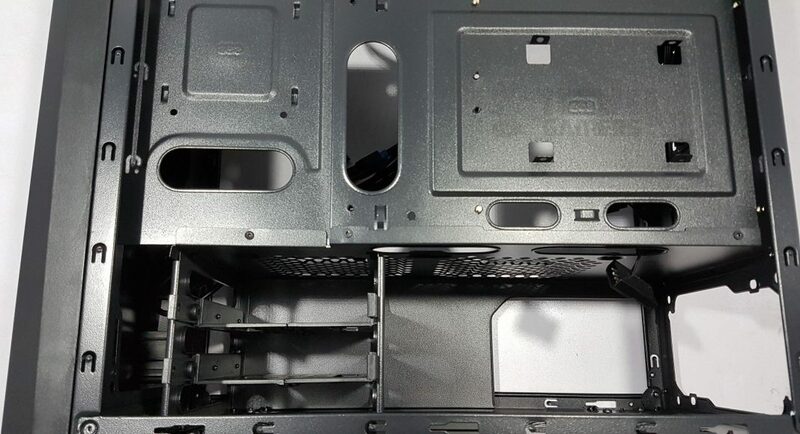 The motherboard tray has inset as compared to the right side frame. The right frame has 3 cutouts. One at the top from where the front I/O panel’s cables are to be moved towards the backside. 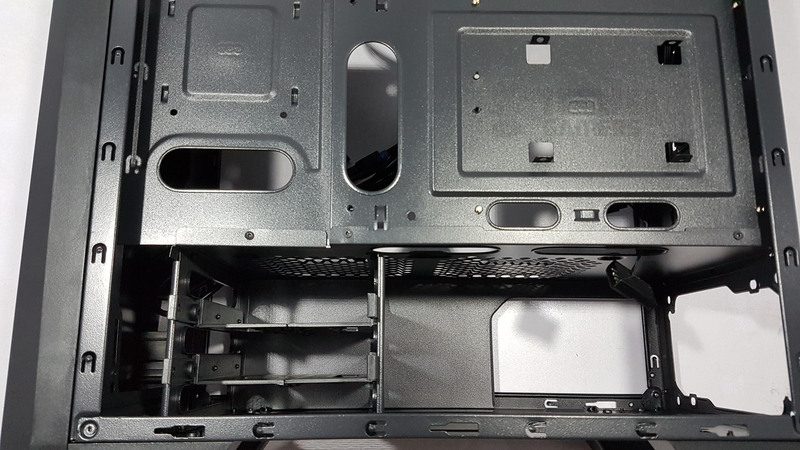 There is an SSD mount in the mid-section of the chassis. There are two cutouts in the horizontal layout with one above the SSD mount and one at the bottom of this mount. 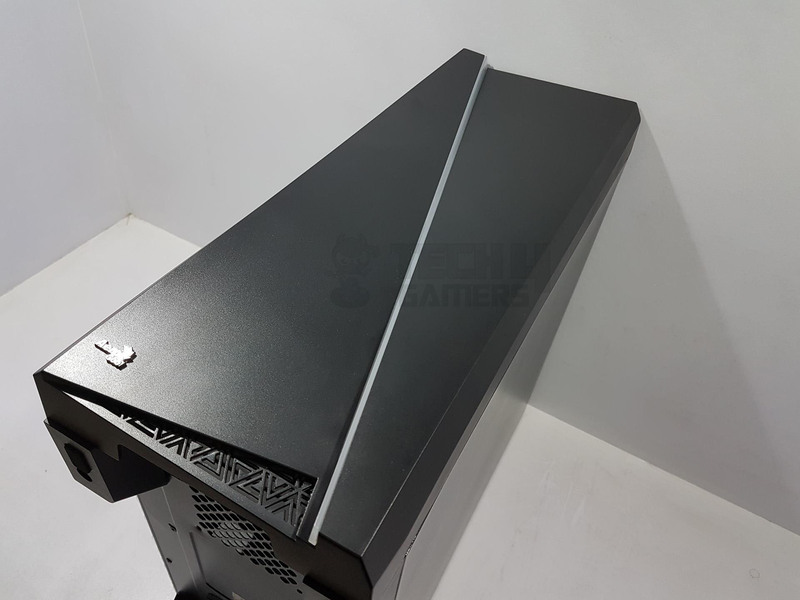 The PSU shroud runs on the entire length of the chassis and makes it a dual chamber design with lower chamber hiding the PSU and the storage drives. 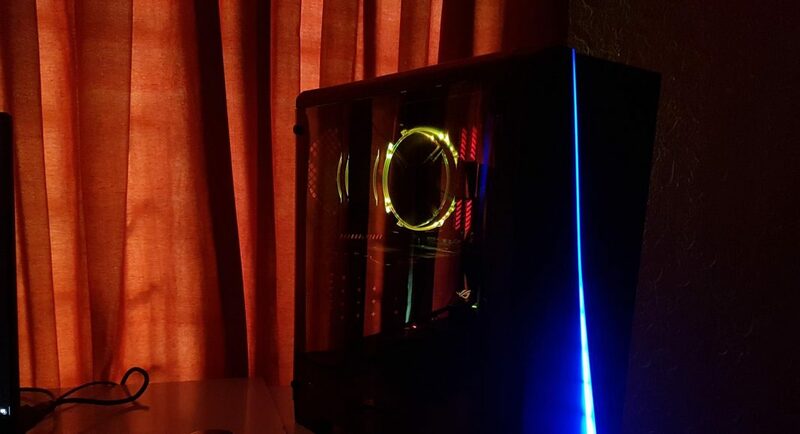 There is a cutout on the left side of the PSU shroud that would show the label of the PSU. 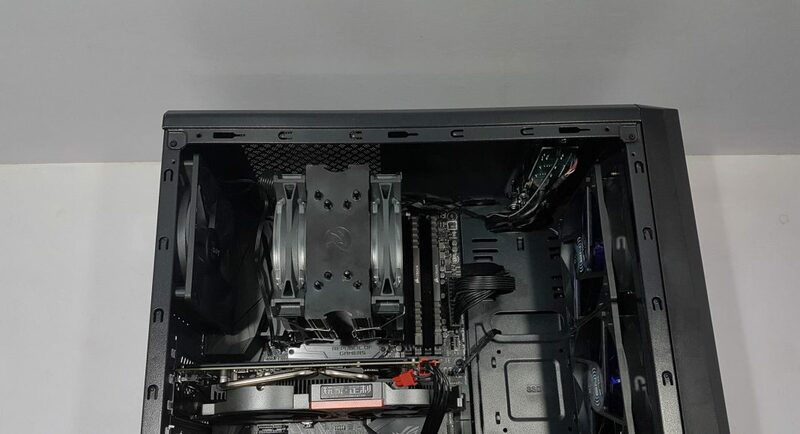 There is a gap between the front side fan mounting rails and the PSU shroud. 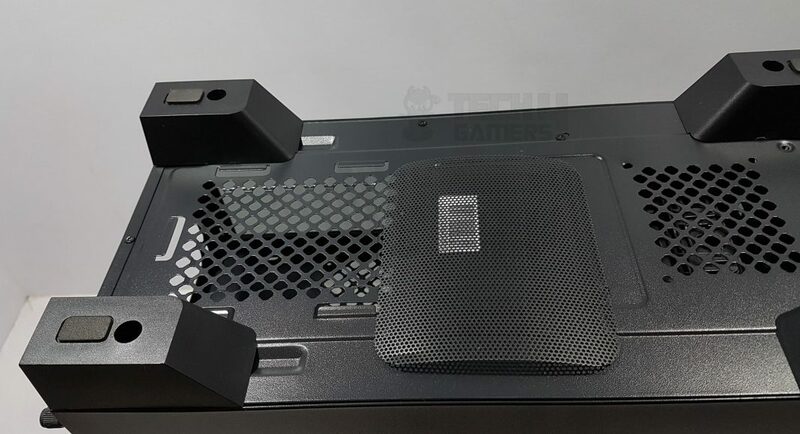 This is to ensure that fan can be mounted on the bottom side of the front panel. 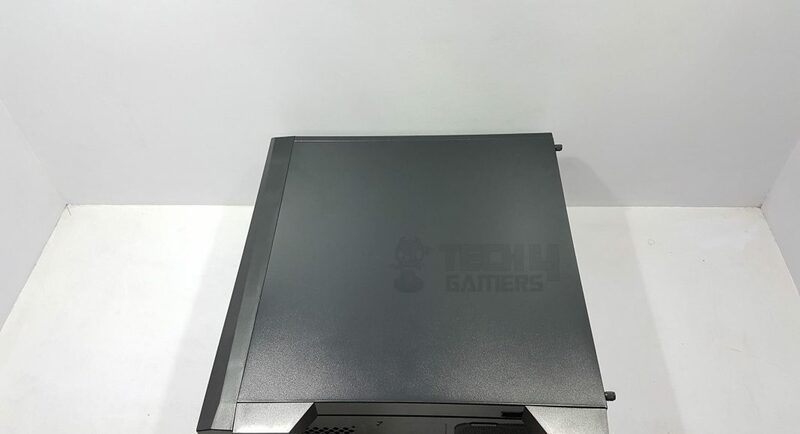 The PSU shroud has raised tabs on it with mounting holes. These are provisions to install two 120mm fans. The vents don’t have dust filters on these spots. 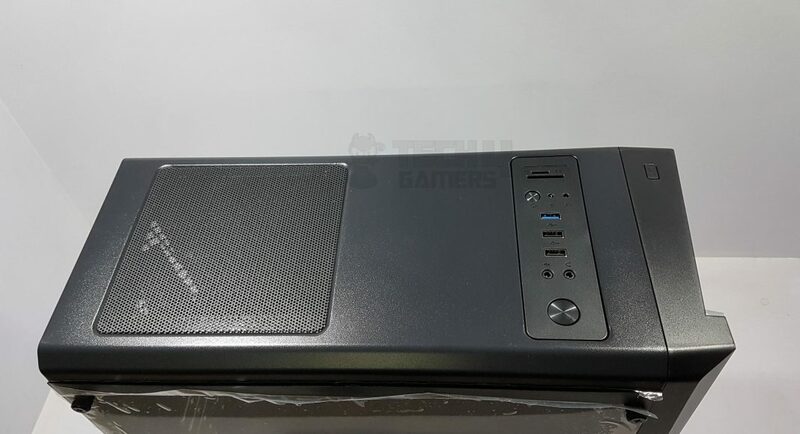 Though it is nice to see two spots for more and direct air throw on the graphics card but the air intake is limited to these spots. 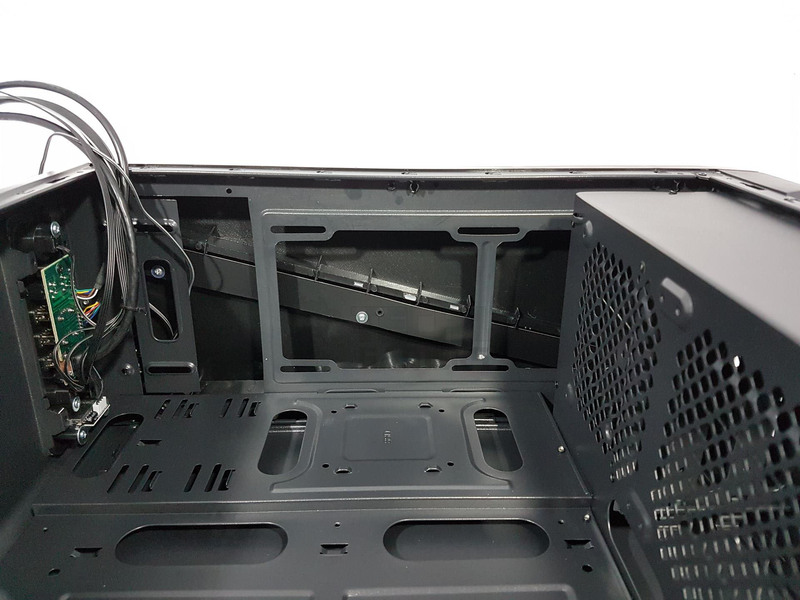 Particularly the right spot is on top of the storage drive cage so expect more hot air from this side should there be HDDs in the cage. 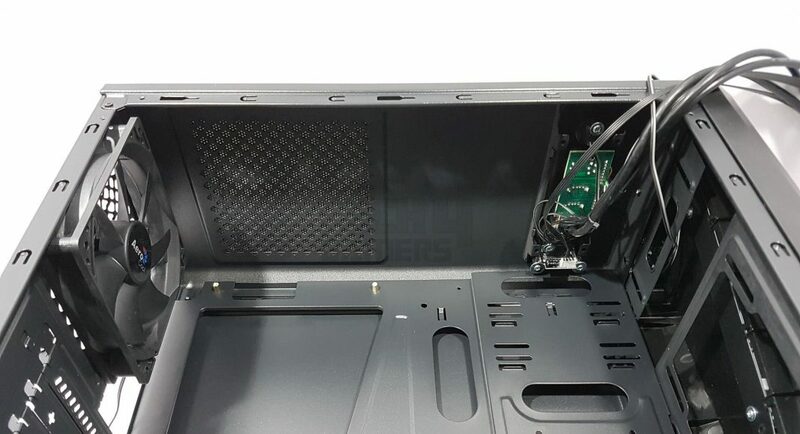 The two holes on the PSU Shroud are well placed as they cover the maximum portion of the motherboard’s bottom side for connectivity. 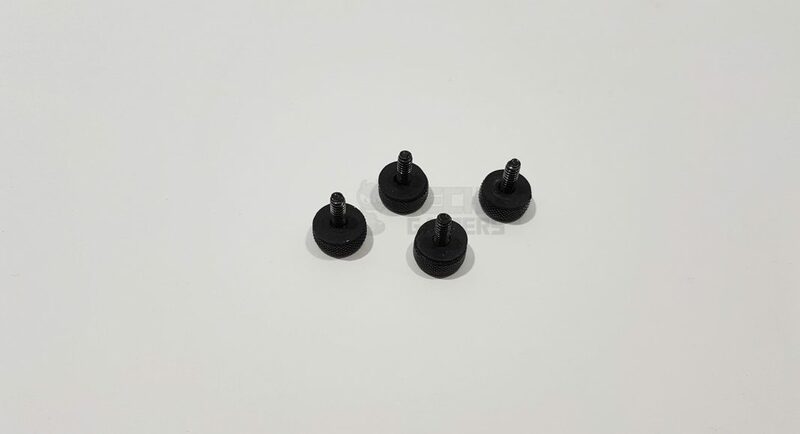 None of the cable cutouts have rubber grommets on it which is another cost-saving measure. 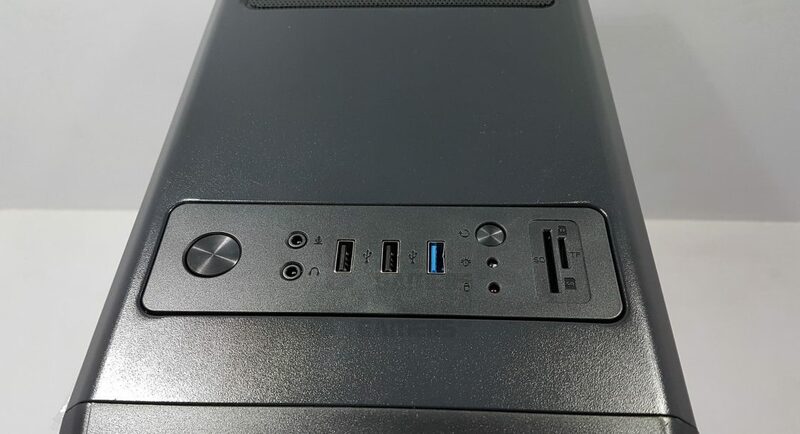 The PCIe slot covers show the snap off design which in my opinion needs to go away in favor of proper reusable vented covers like the first slot cover. 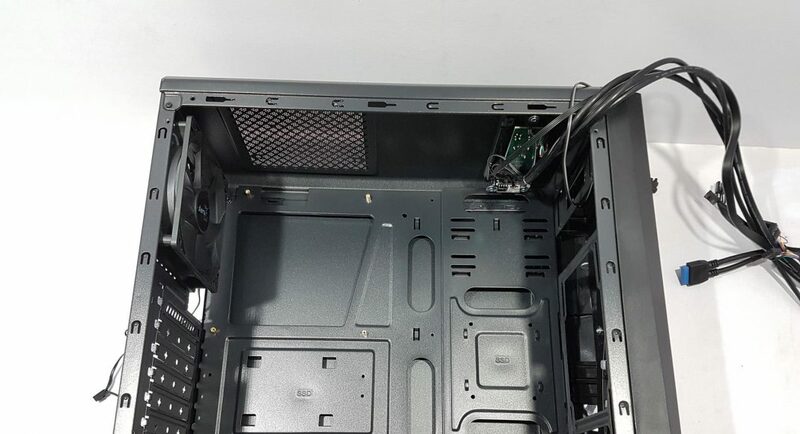 The pre-installed 120mm fan has a 3-pin connector and a Molex/peripheral one as well. This is surprising as most of the today’s motherboard have enough fan headers to power the fans but it is still a nice addition by the manufacturer but the distance between the 3 pin connector and the Molex needs to be increased as they are on the same cable and distance is less so it makes it difficult to better cable manage it. Let’s take a look at the backside of the frame. On the top side, there is a cutout on the left and the right sides. 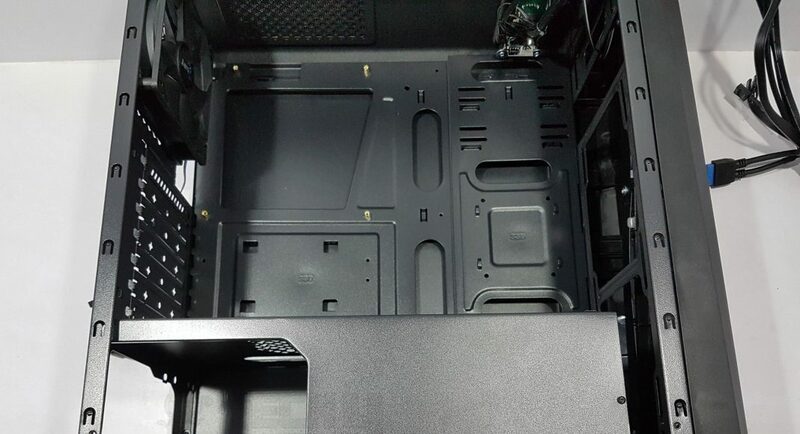 There is a large size CPU Cutout area to help make the CPU cooler’s installation easy. 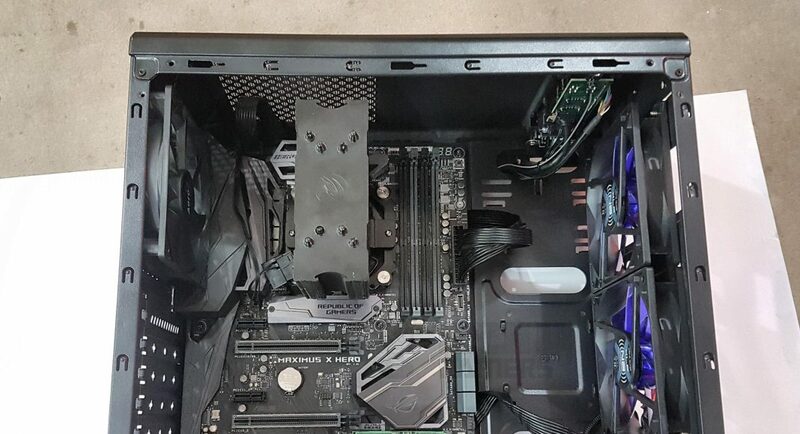 There is an SSD mount on the motherboard tray under the CPU Cutout area. There are 6 cable tie spots on the backside. Though this is not a complaint but a few more would have come handy. On the bottom, we have the second chamber. 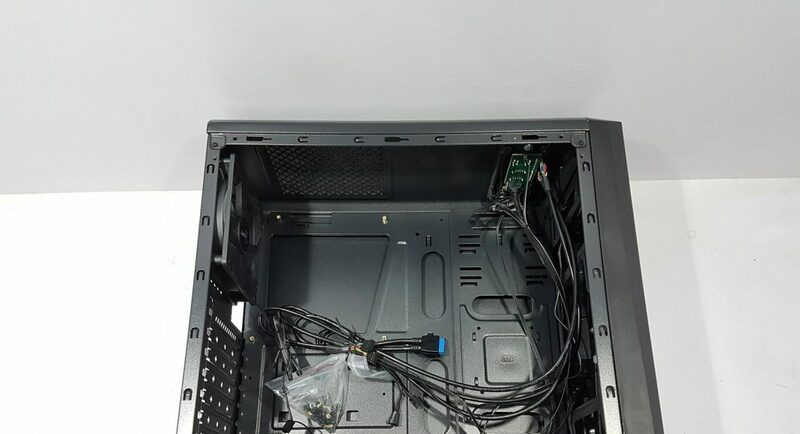 On the right side, there is a PSU mount area. 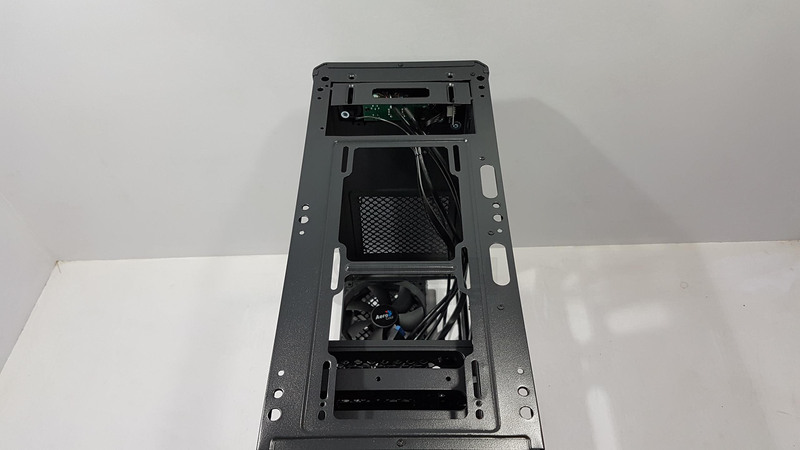 PSUs up to 180mm can be used in this chassis though I would suggest the builders to use 160mm or less otherwise it would leave much less room for the cables hiding between the storage drive cage and the PSU itself. 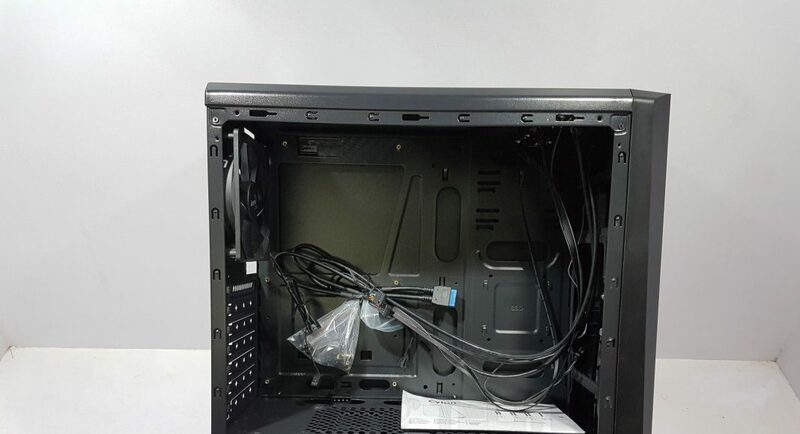 The left side has a storage drive cage. This cage is fixed to the cage (riveted) and can’t be taken out. It has two caddys. Each caddy can mount either 3.5” HDD or 2.5” SSD. Each caddy has SSD text printed on the SSD mounting holes to easily identify them. The included cables are USB 3.0 connector cable. This cable also has a USB 2.0 connector on it as well. There is another USB 2.0 connector for the USB 2.0 ports and an additional USB 2.0 connector for the microSD card reader. 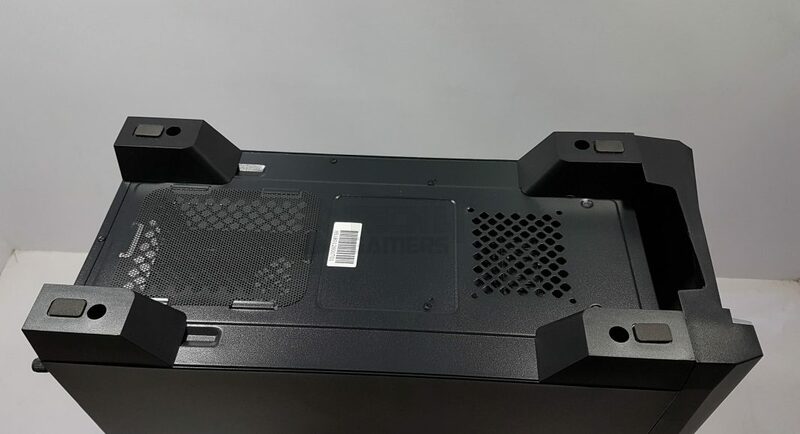 There is a front panel connector cables, HD Audio cable. 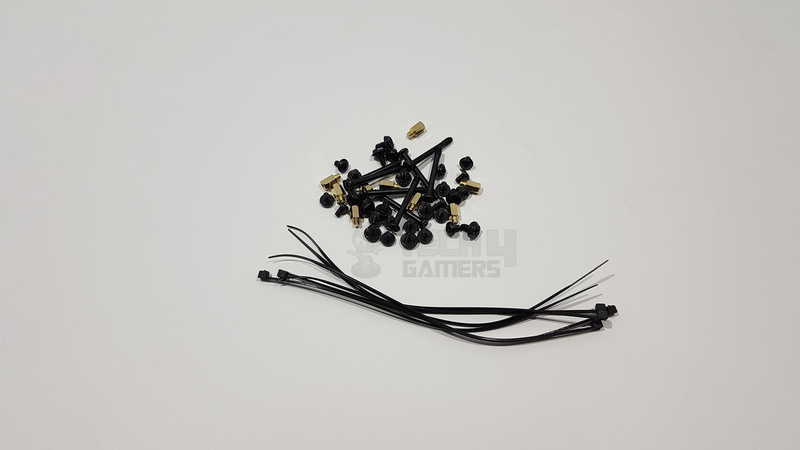 Length of each cable is plentiful to make it easier to route them from behind the motherboard tray for proper routing and cable management. 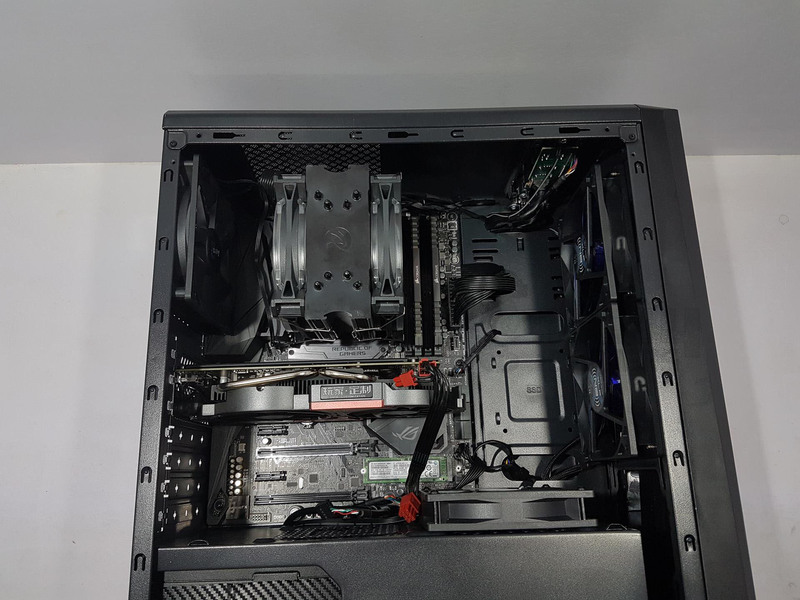 As this chassis comes with only one 120mm fan pre-installed, I have used two 120mm fans on the front side for air intake and one on the PSU shroud above the storage drive cage. 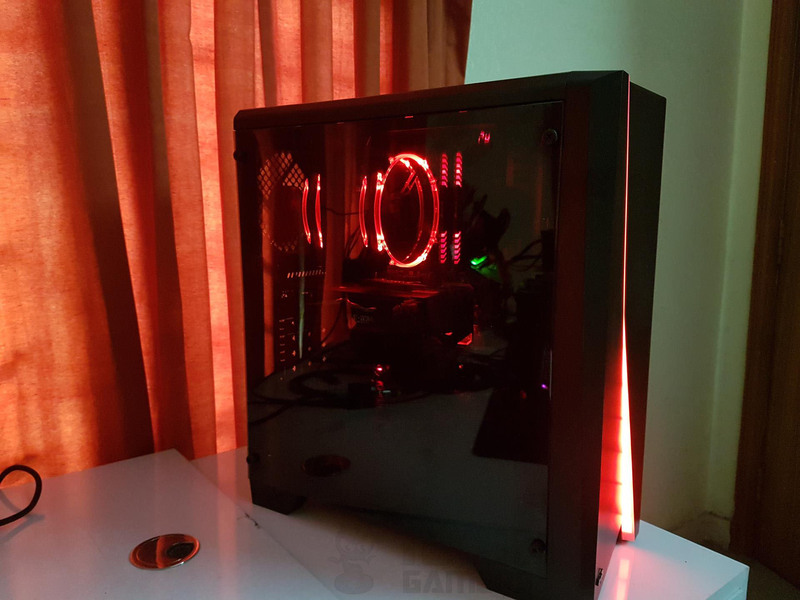 The additional fans used are Noiseblockers NB-BlackSlientFan XL-P with an airflow rating of up to 75.3 CFM at the static pressure of 2.790 mmH₂O with a maximum rotational speed of 2000 RPM. The motherboard that I have used is the Asus Maximus X Hero which has the dimension of 12” X 9.6”. This motherboard covers the entire motherboard tray including the vertical cutouts for cable passing. This presented me a challenge on the cable passage. Either I would have to improvise or use the two horizontal cutouts above and below the SSD mount. The latter option would not have produced a clean build. So, here is what I did. I started with the fans. 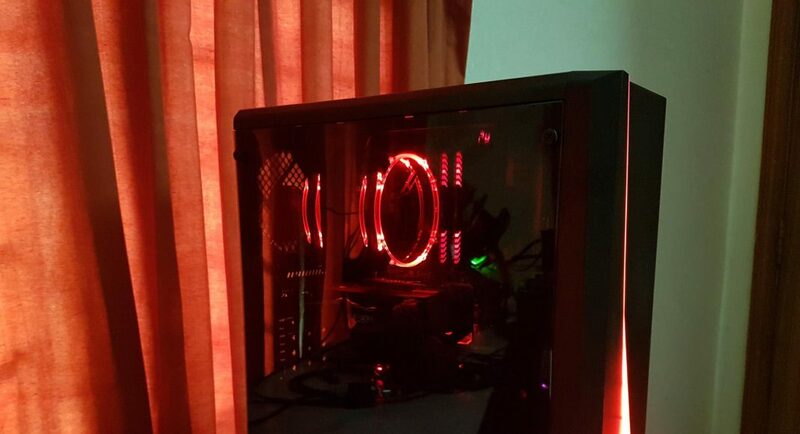 Then I installed the PSU. 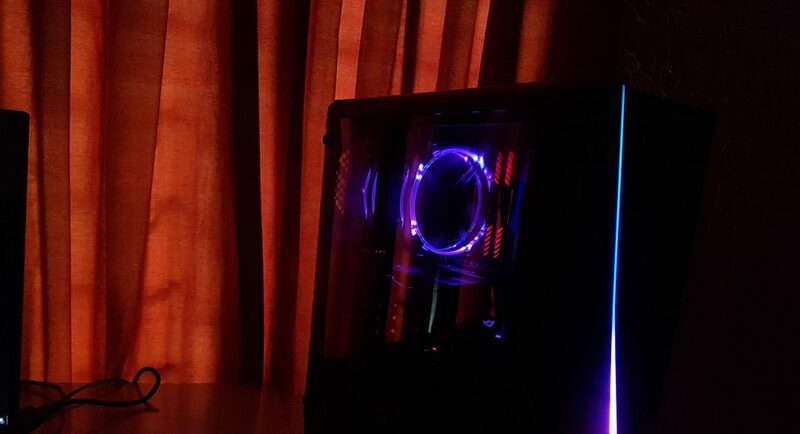 If you are using modular PSU then I would suggest connecting the required cables to the PSU before putting it in. Then the EPS, 24-pin ATX, and PEG cables were routed through the cutouts before installing the motherboard. Thankfully, this PSU has flat cables which were proven to be handy for this sort of situation. Next step was to put in the three standoffs so that full ATX motherboard can be fully secured to the chassis. 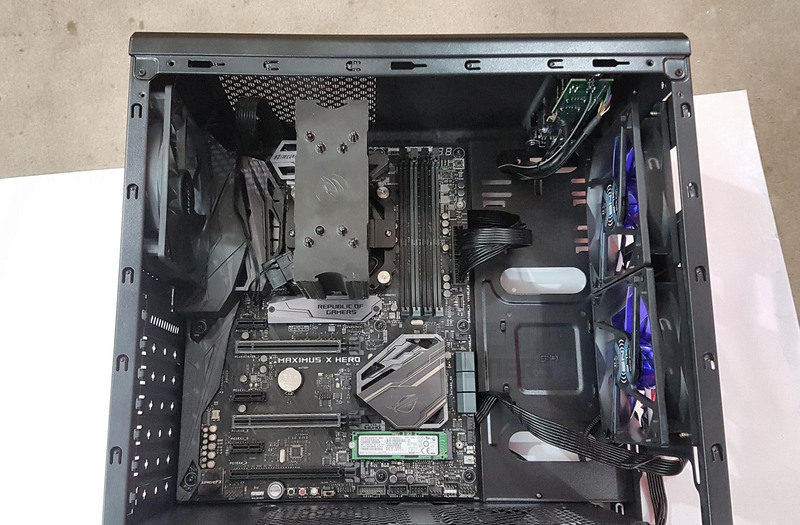 Afterward, I placed the motherboard on the standoffs by carefully aligning the mounting holes of the motherboard with the standoffs and making the cables to flat out to the extent possible. Another limitation was observed during this process. 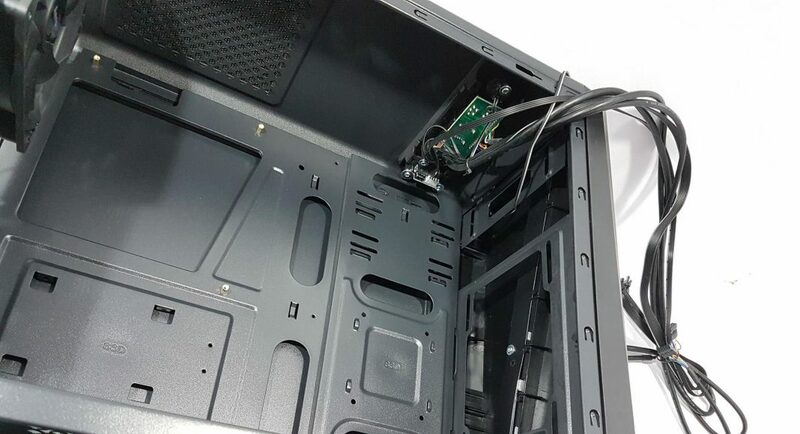 The I/O cover of the motherboard is high profile and it was obstructing the installation of the rear 120mm fan. 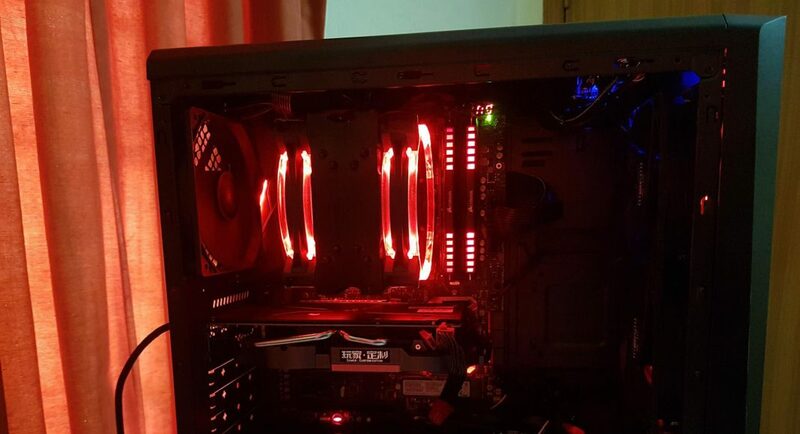 I had to take out the fan first and then installed the motherboard. 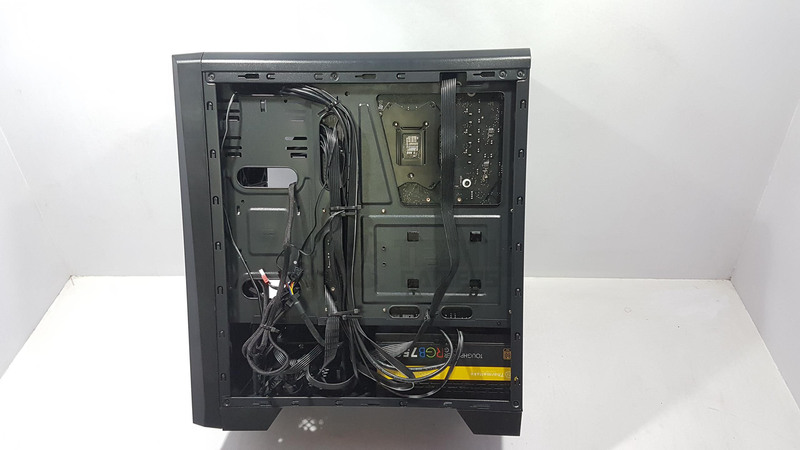 Once the motherboard was installed, it gave much better and clean look with this improvised cable management. The rear 120mm fan was then installed and it was a tight fit through at the end it was a fit nevertheless. Rest of the installation was pretty breeze and I enjoyed building on this chassis. 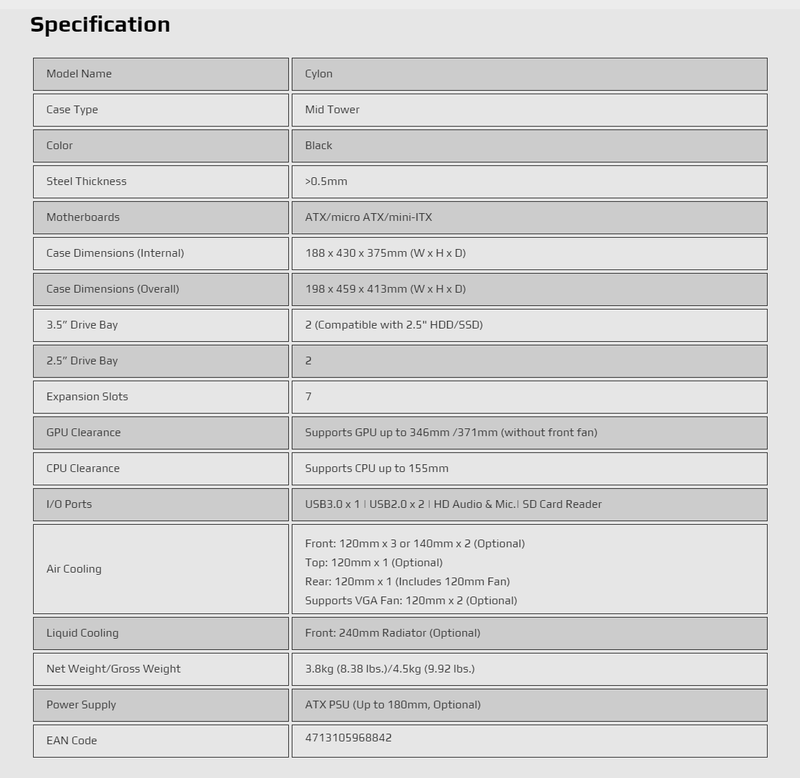 There are ATX motherboards on the market that have length of 8.8” not 9.6”. 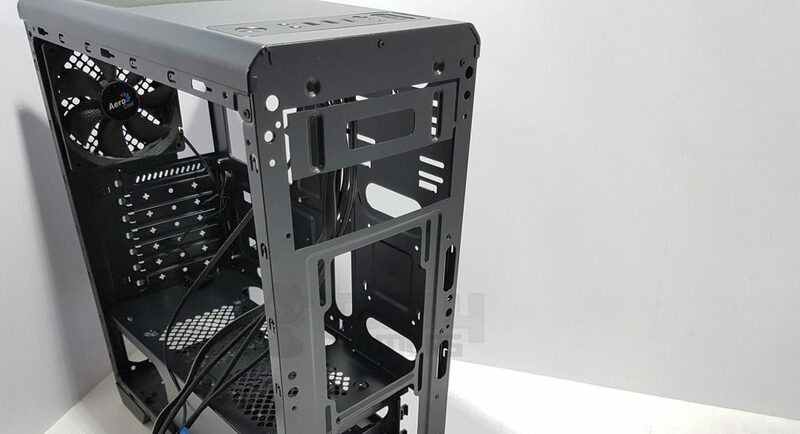 They are ideal for use in this chassis as the cutouts won’t be covered or obstructed by the motherboard and cables would be easily set up. I am sharing my experience so that the readers would know the limitation if any and the possible solution as well. 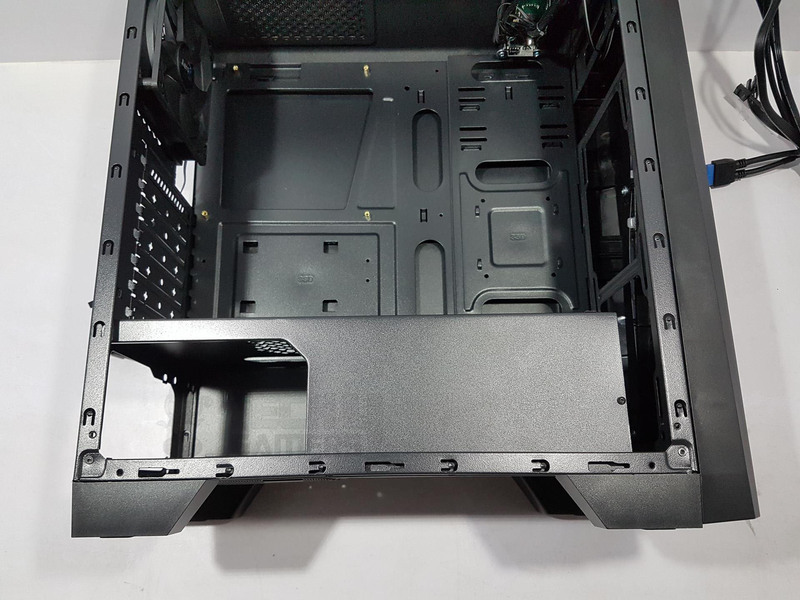 On the airflow perspective, this chassis has restricted air intake and I would suggest Aerocool to have at least one more side of the front panel implemented with vents having dust filter as well. 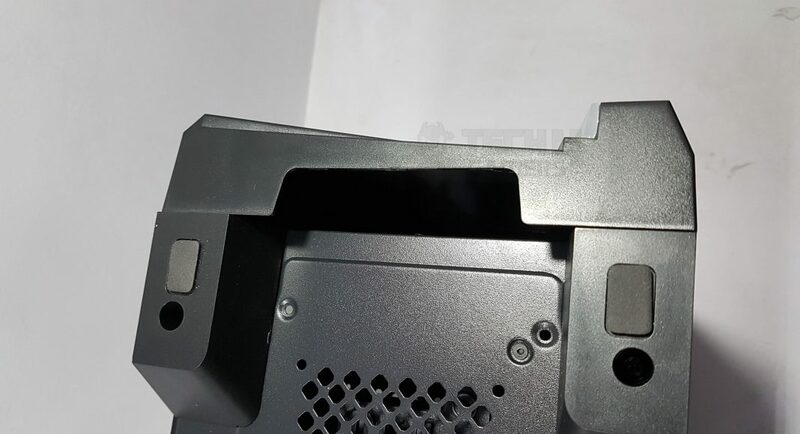 This would improve the air flow and as the fans are already being mounted on the inner side of the chassis, this would bring improvement in the airflow and cooling performance of the chassis. The bottom mounted fan was throwing better air than the other two. Another suggestion is to add at least one more fan at the front. 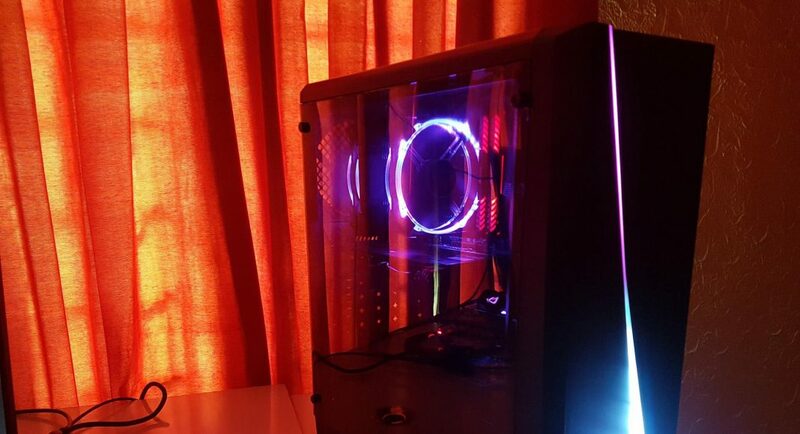 They had sent us their 240mm AIO for review but same was not used in this chassis for the reason that a budget builder would probably be sticking with a budget CPU Cooler or 120mm AIO in the budget build. 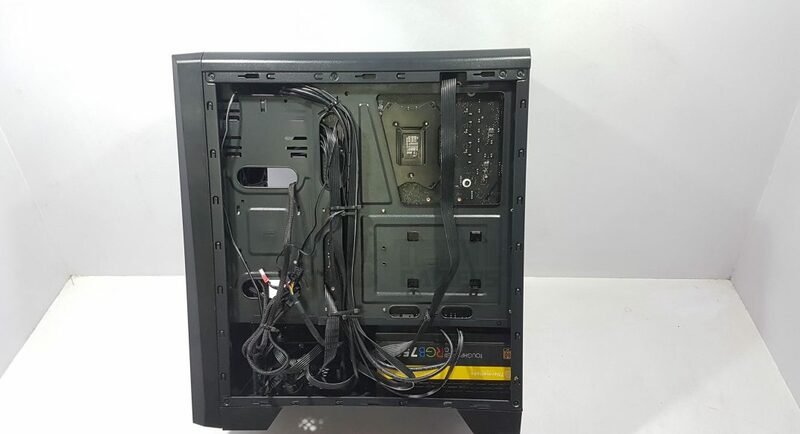 Cable management on the back is decent and as such did not present any challenge or reportable observation. The button acts as a toggle and pressing it at a time would cycle the mode one be one in the order described above. 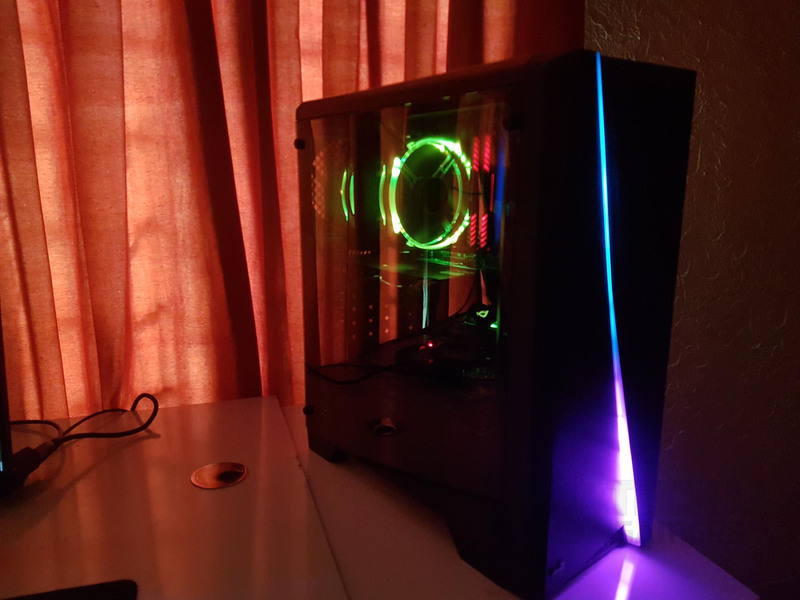 Overall, building experience in this chassis was good and it took me less time to build inside. I did not use GTX 1080 FE as it is under Alphacool Eiswolf GPU Cooler. The thicker rad was not a fit on the rear hence went with the GTX 1050Ti in the test build. 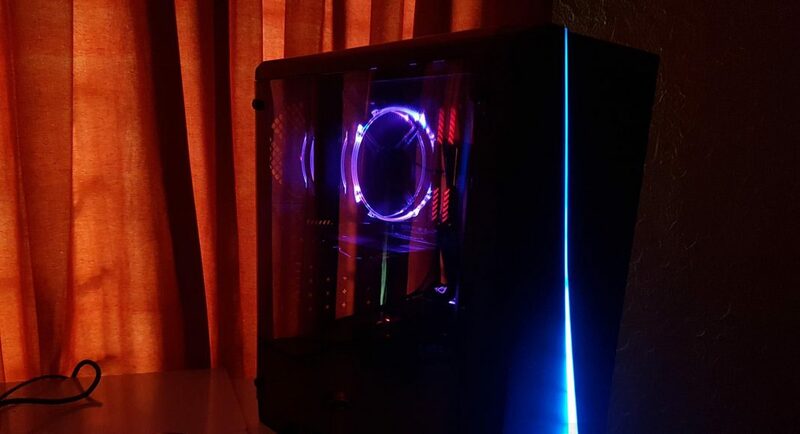 My build has shown that despite being budget, entry-level chassis, this chassis can accommodate enthusiast grade build easily. 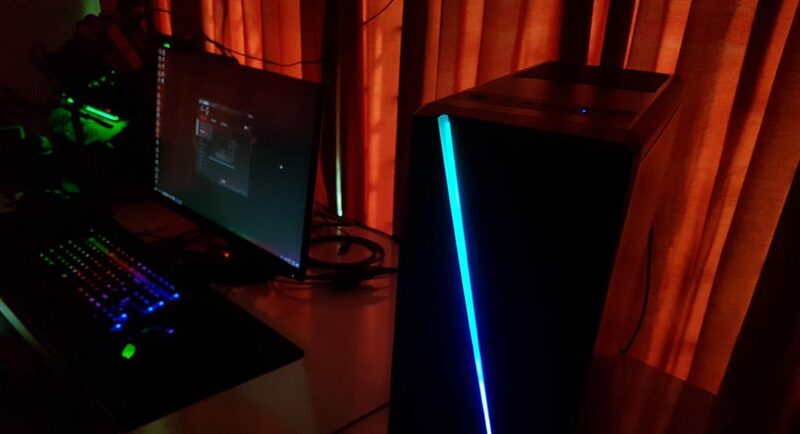 The footprint of this chassis reminds me of the Corsair 460X though both are from different classes. It takes much less room on the table and creates pleasant looking effect even when it is not powered up. With power on, we have an eye candy where the form meets the functionality. 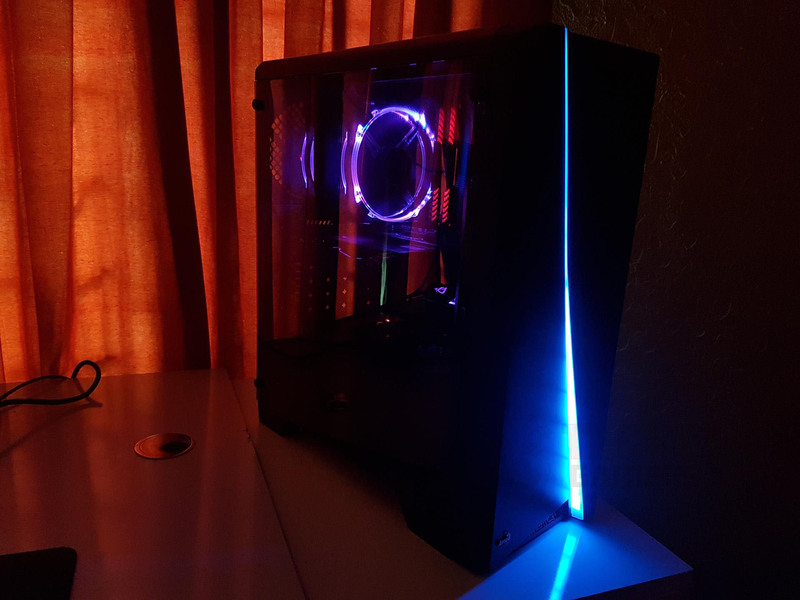 This chassis has window side panel using lightweight acrylic and follows the mounting that we get to see on the tempered glass panels. This is rather a cost-saving aspect than anything else. 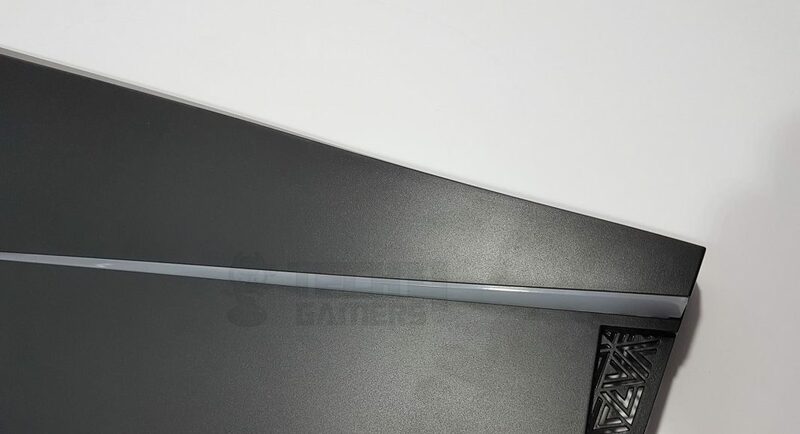 The PCIe slot covers are fixed and follow the snap off design. Once, removed, they can’t be used again which seems to be another cost-saving factor. The overall build quality is better. There is only one air intake on the front which is from the bottom or underneath of the bottom side. This design restricts the airflow. The fan closer to the source would provide ample airflow but the fans far from the source would not be effective. 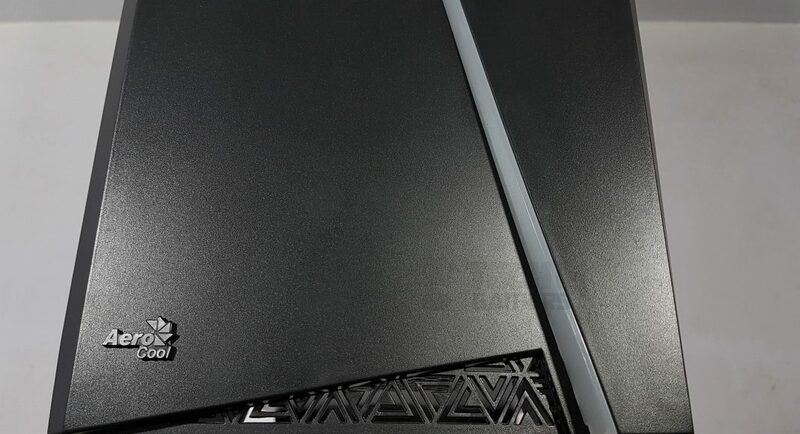 The full-size ATX motherboard (12” X 9.6”) covers the entire motherboard tray including the cable cutouts. 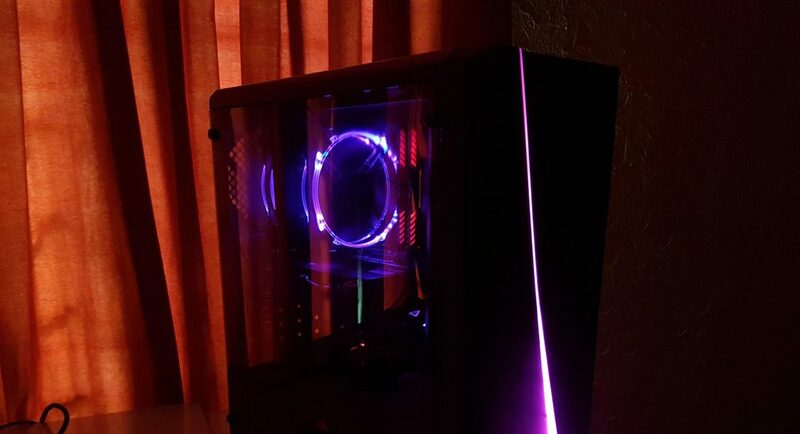 The window side panel is black tinted and has more reflection on it. 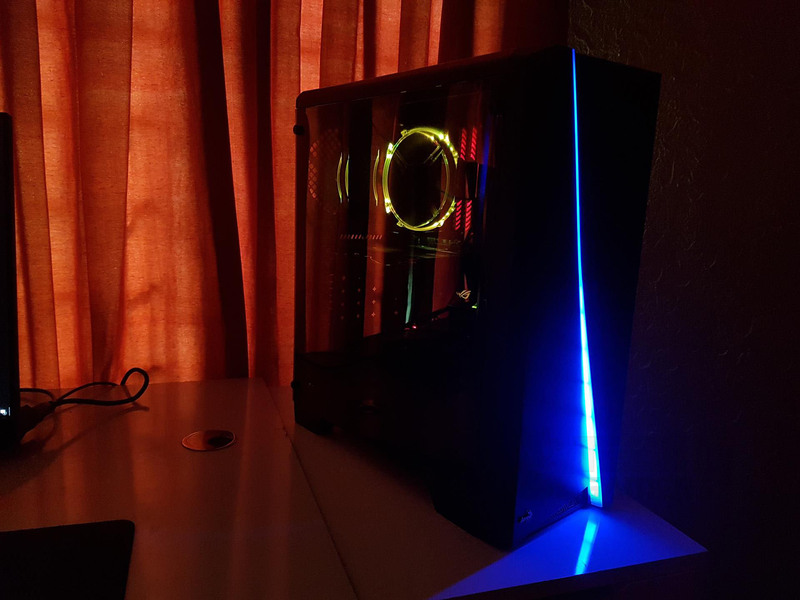 You would need a LED Lighting solution to illuminate the interior of the chassis. 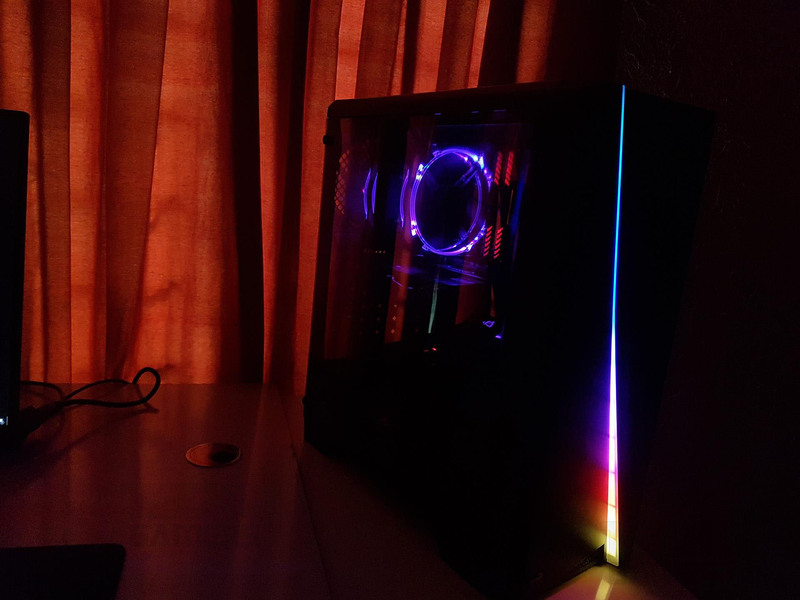 Overall, building experience in this chassis was good and it took me less time to build inside. 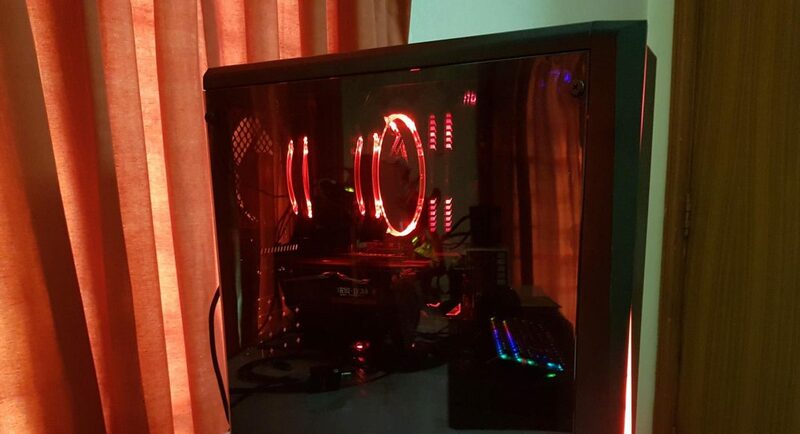 My build has shown that despite being budget, entry-level chassis, this chassis can accommodate enthusiast grade build easily. 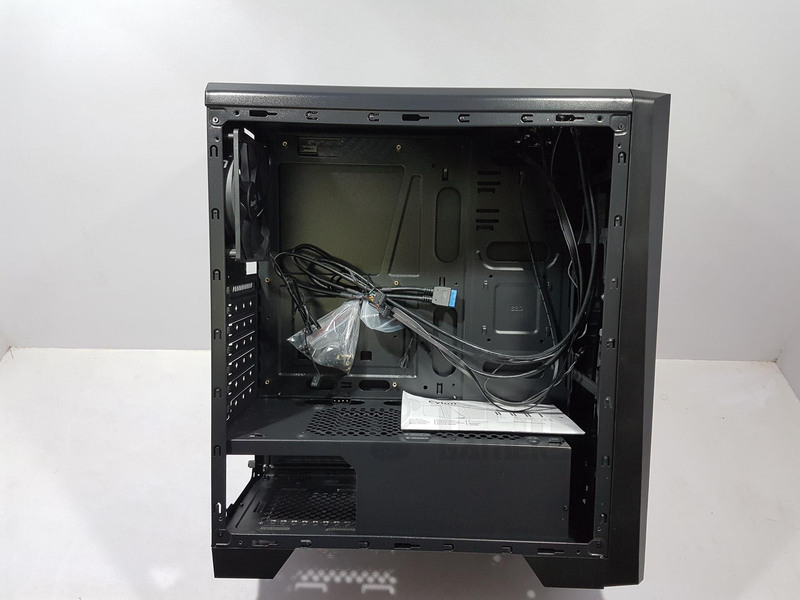 This chassis is rated at €39.90 / $49.99 making it budget friendly chassis that won’t break much of your bucks and will give you the form and functionality within this price bracket. 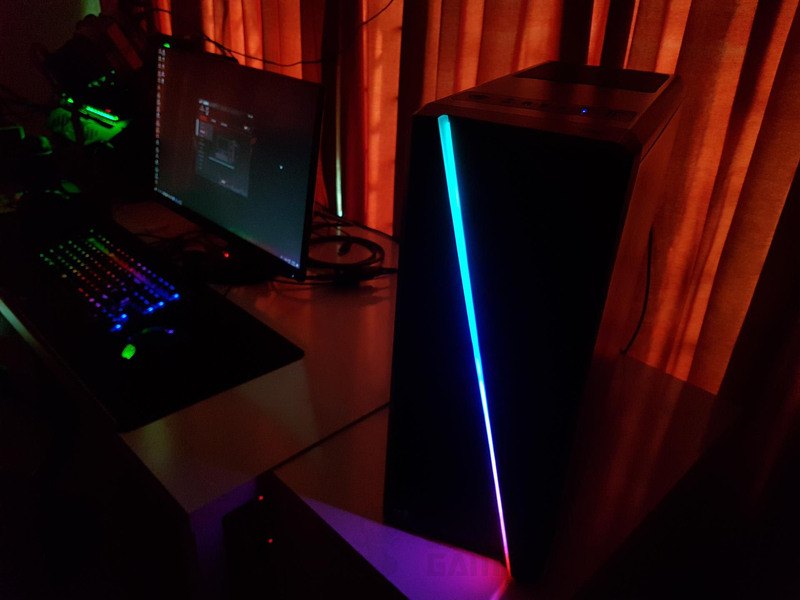 We are thankful to the Aerocool for giving us the opportunity to review their Cylon RGB Gaming Chassis. What do we expect from a budget-level chassis? A fair design with not so many features and could be without form yet with basic functionality. 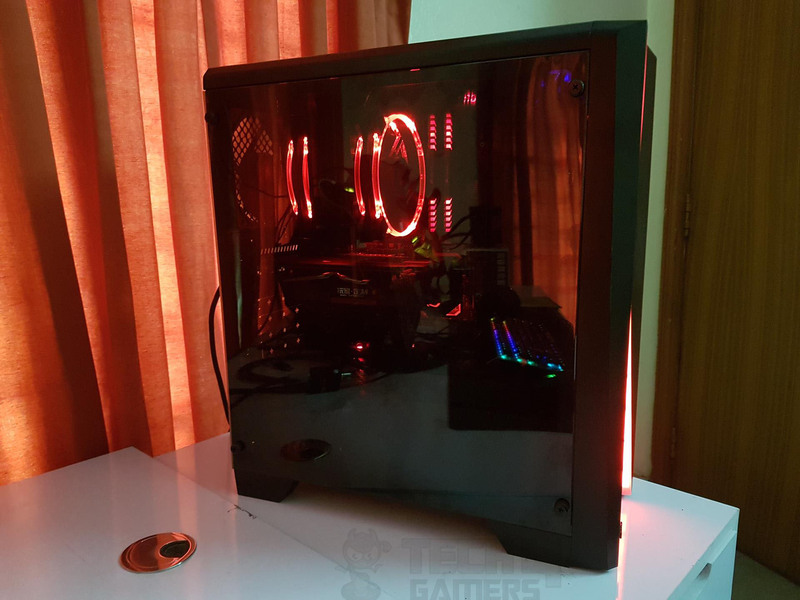 Aerocool has considered these points and came up with an entry level, budget chassis that not only has got functionality and features but also the form. Though this is done with some caveats those caveats could be had in the budget level chassis. 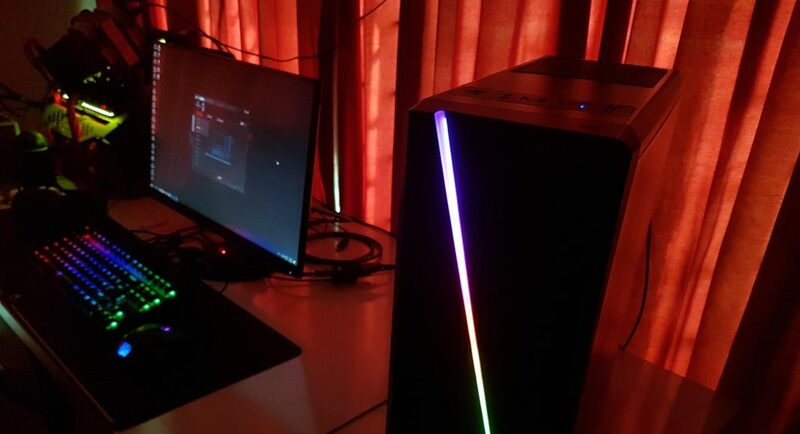 It has beautiful and stunning RGB lighting on the front with a single button control. It has a triangle shape cutout hollow design at the bottom to act as air intake and yet add bold looks to the chassis. 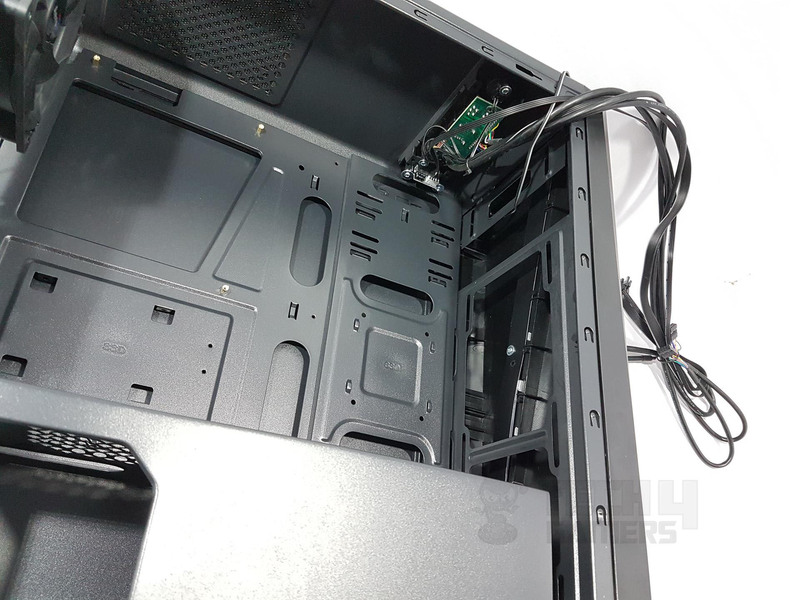 It has an added feature of the card reader and a window side panel to showcase the build. This is not all as we have only highlighted the exterior. 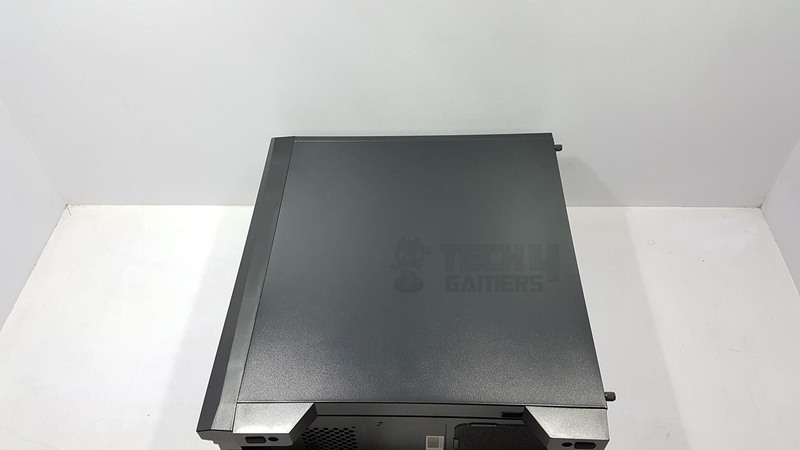 It has a PSU shroud with a possibility to mount two 120mm fans on its top to throw air directly on the graphics card, dual chamber design, possibility of mounting 240mm radiator on the front. 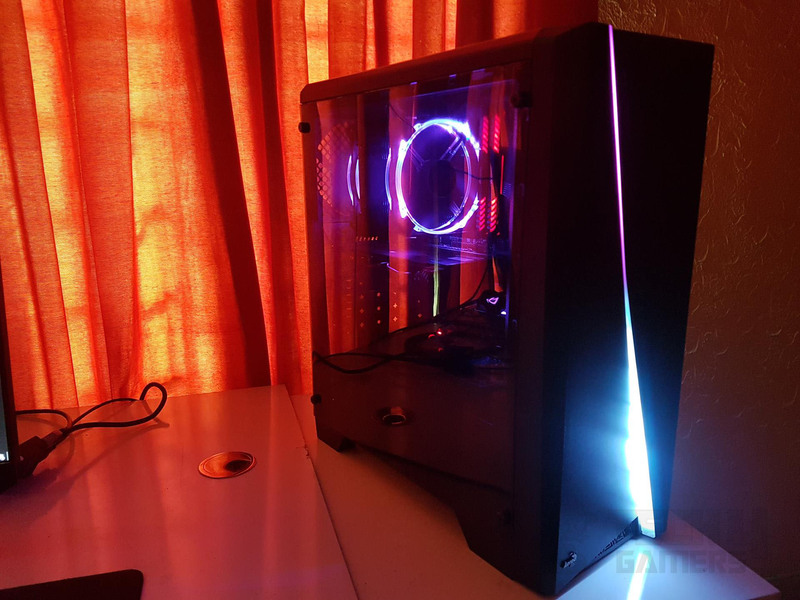 Not to mention that this chassis comes in black and white colors in the same price range. 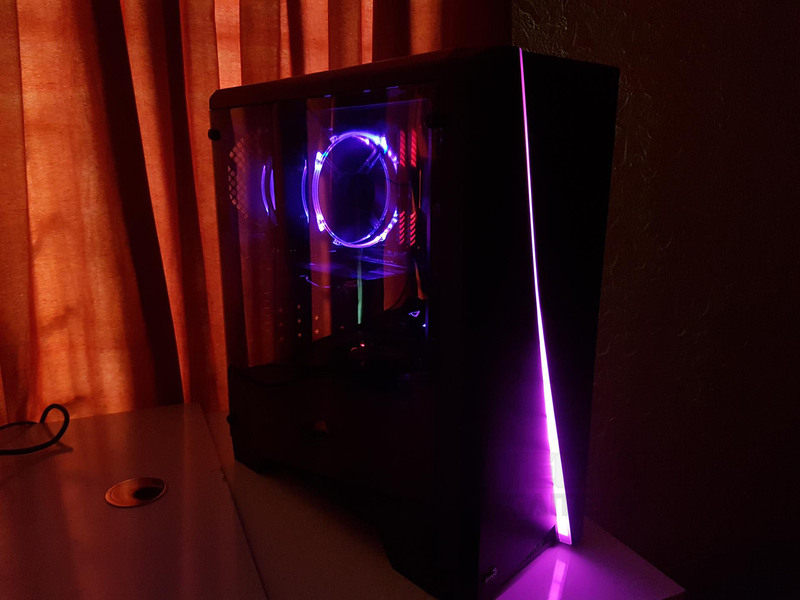 This chassis has got everything that a budget user could have asked for. This is definitely a better value for your bucks.